What an extraordinary beginning we've had, Raptor Families! I have to tell you, we've made some amazing strides in an incredibly short time. We've added 14 new staff members, including two guidance counselors, a teacher for exceptional students, a media assistant to manage our growing library, and a school nurse. These new additions acclimated quickly with the mentorship of our existing, dedicated staff and faculty. All together, they make a tremendous team of educators and support staff. On a daily basis these past six weeks, we've watched the new Gymnatorium transform from a massive cement slab to a recognizable structure with a roof and walls. We will celebrate its Grand Opening in the spring and are thrilled by the prospect of hosting true “home” games on our own fields and our home court. We will also celebrate a major life event in this new venue: the Class of 2019 Graduation on June 9th at 2 pm. president; and Senior Sarah Hornback, secretary. Two representatives were also elected for each class. The winners were seniors Liv Giurintano and Mercy Witherspoon, juniors Ayuma Kremzar and Caprice Fullam, sophomores Isaiah Grayson and Michaela Tse, and freshmen Tony Sena and Mason Fitch. I'm confident they will set a high benchmark. We hope you enjoy our Raptor Recap, which highlights the students and teachers fantastic start this year. Wishing everyone a restful and recharging rest of Fall Break. 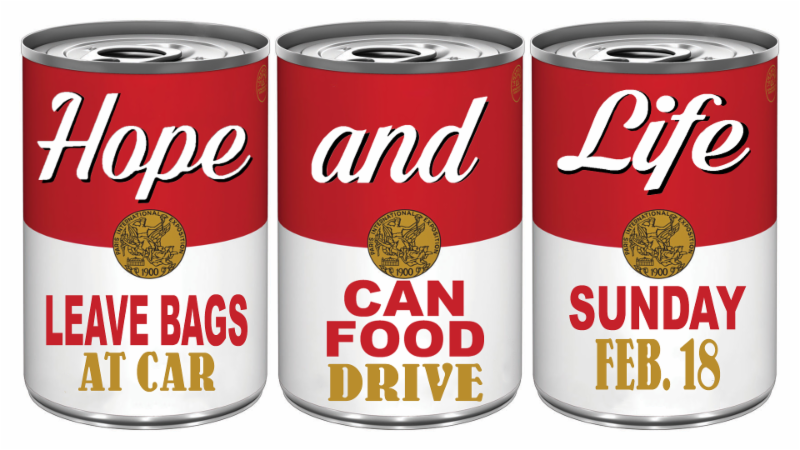 Please Support Our Hickory Nut Gorge Outreach Food Drive! The winning homeroom in the Middle/High School and the Elementary will receive a pizza party courtesy of the NHS/NJHS.The Secondary is competing for one pizza party and the Elementary is competing for one pizza party. The classroom that collects the most cans overall will receive a trophy and a $25 Amazon Gift Card for the classroom. 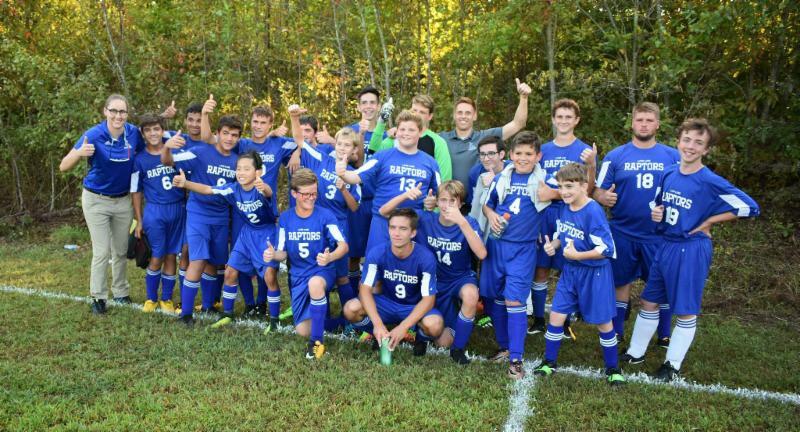 The boys soccer season is coming to an end. Despite it being our second season, we won our first game and more than doubled our total points from last year. It's been a lot of fun working out and getting better as a team. Our tournament begins the week of October 15th. 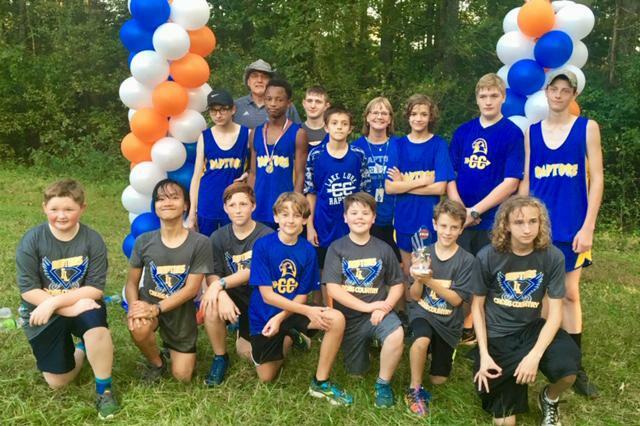 LLCA Cross Country set new goals for the 2018 season. 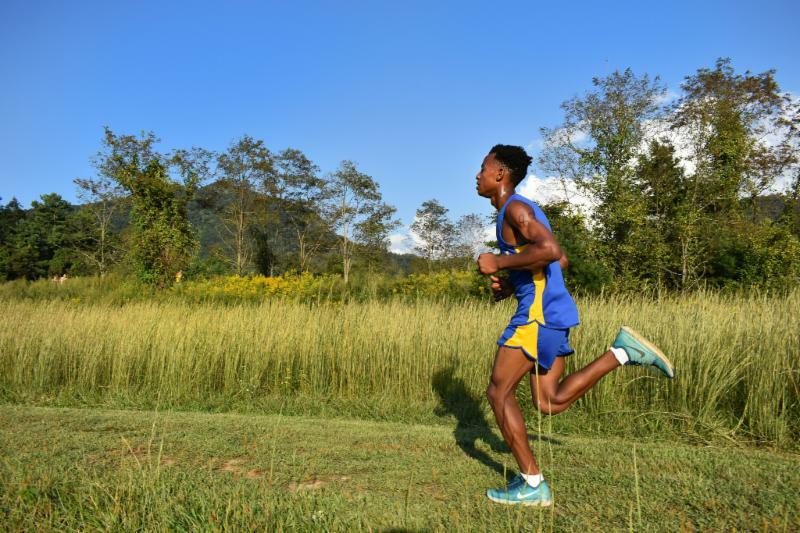 Three runners, Oska Gobin, Roxanna Duarte and Christopher Hudson, ran in the WNC Cross Country Carnival in August. 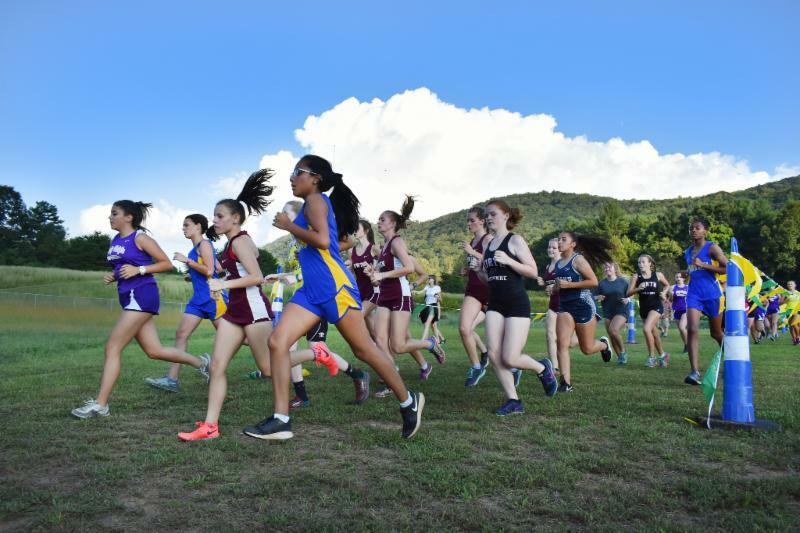 This meet showcases the best runners in western NC and SC. 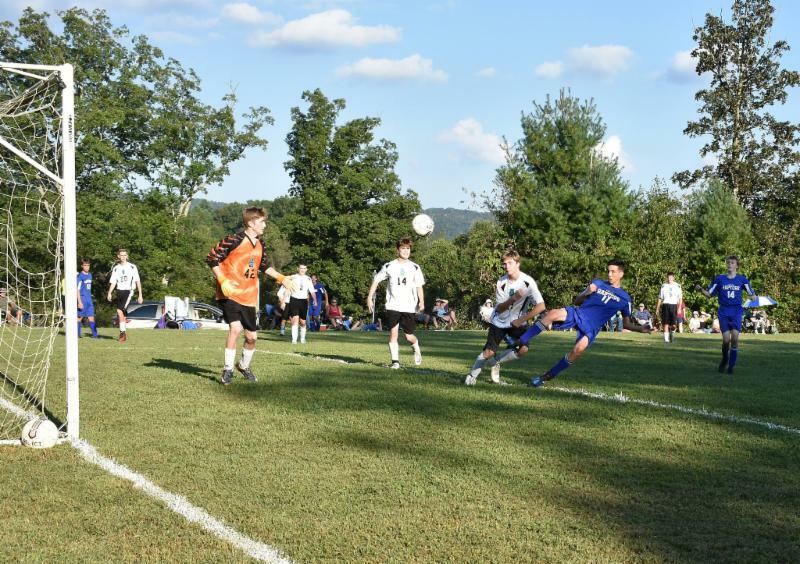 September saw the team compete at Cramerton Christian, AC Reynolds, and Asheville Christian. School records were set by Roxanna Duarte (8th grade) with a time of 22:18, and Oska Gobin (9th grade) in 18:20. 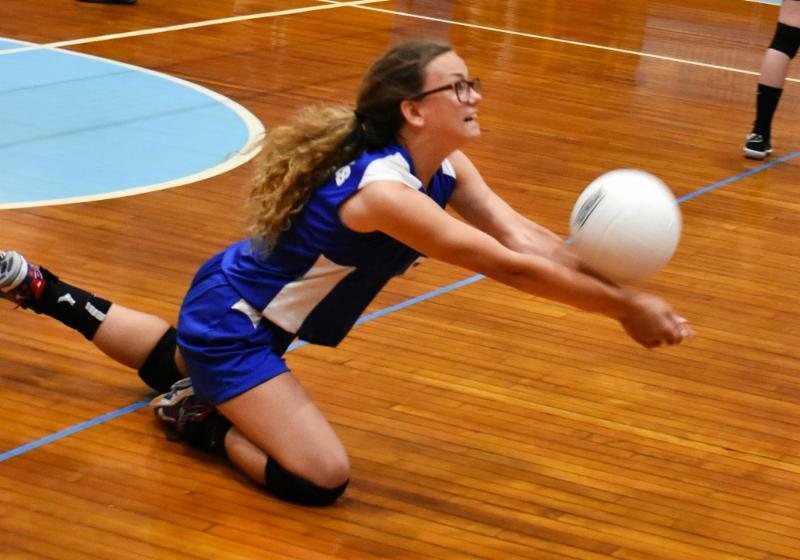 On October 4th, the teams competed in the CSAA state conference championships. Our boys team, led by Oska in 2nd place, earned the 2nd place trophy. The LLCA girls team won their 3rd CSAA championship! 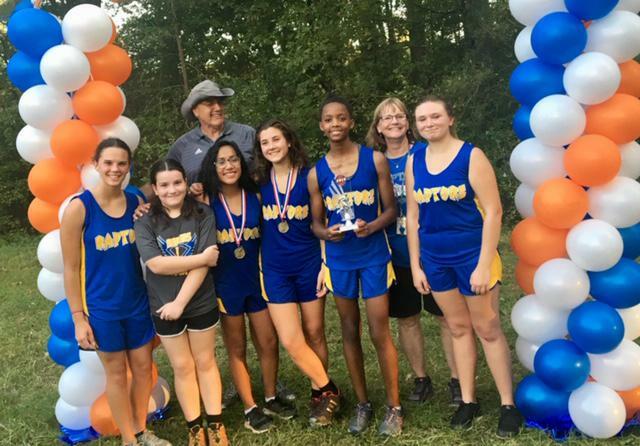 Results were as follows: Roxanna, 3rd; Naomi White, 5th (both winning CSAA All State honors; Rachel Dawkins 6th; Jeska Gobin, 8th; Samantha Ott, 12th; and Wren Sherrill, 16th. Congratulations to both teams! The season will wrap up with the Bolt Invitational in Asheville on October 25th. This season is one for the record books. Remember, if you want to run at LLCA, you have to fly like a raptor! 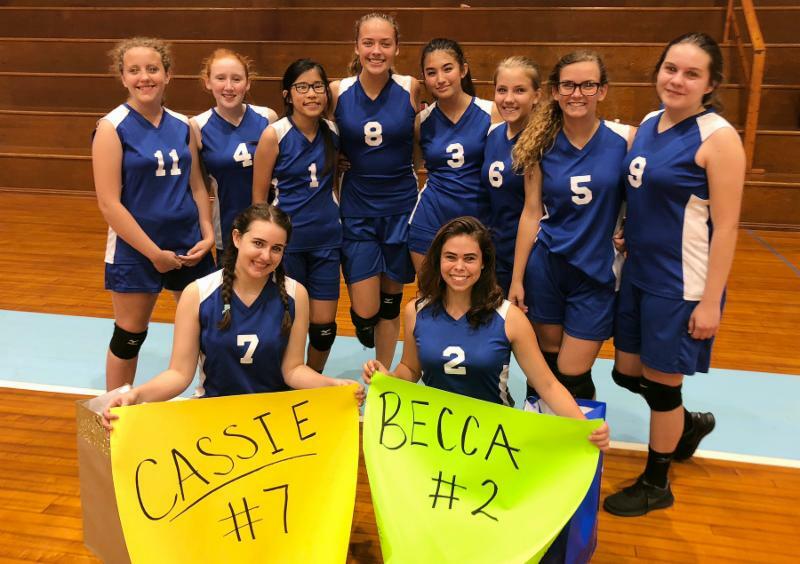 The 2018 Volleyball season has been one for the books! With impressive comeback wins and several 3-0 sweeps, both the JV and Varsity teams have truly been impressive thus far. 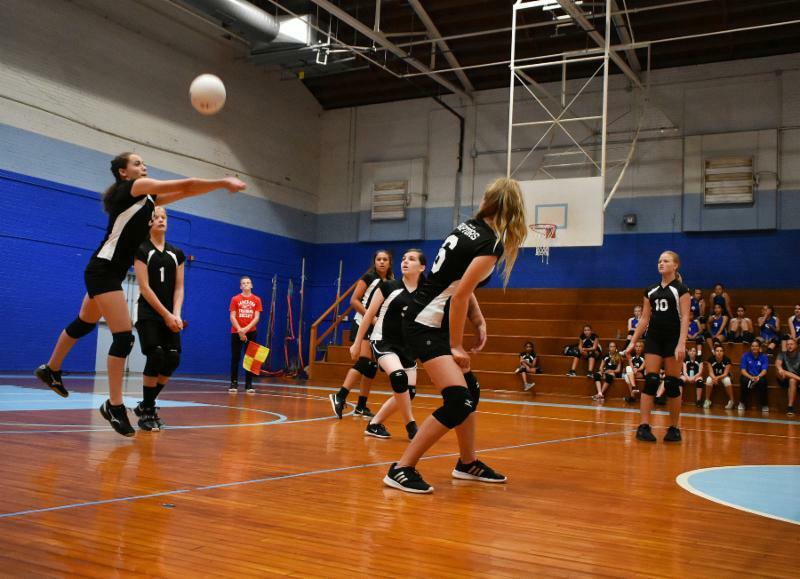 The JV team has won both of their games over The Masters Academy, including a nail-biting three-set match back in September for their first win of the season. The Varsity team's season has been a tale of two halves. The first half of the season, the team struggled to get everyone on the same page. 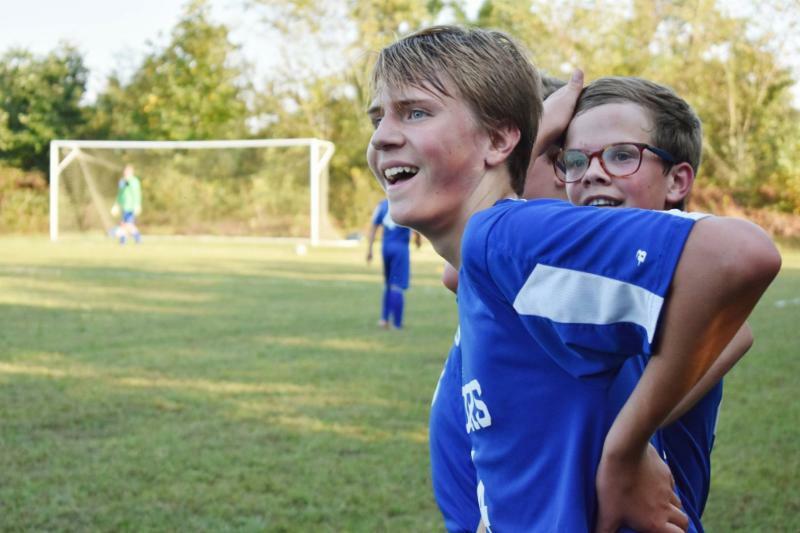 But after back-to-back wins over Grace Christian and The Masters Academy, the girls really turned the season around. 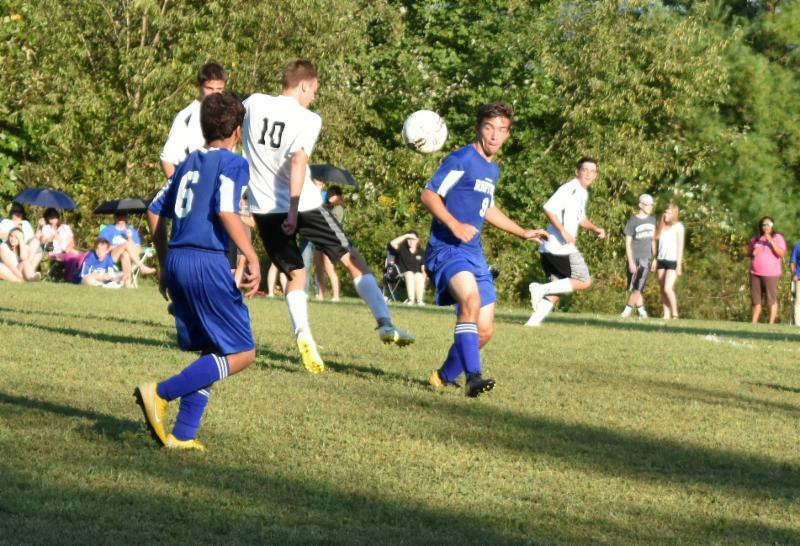 This was highlighted by a home victory over Heritage Christian who defeated LLCA in the first game of the season, 3-0. The Varsity girls returned the favor and defeated Heritage Christian by a score of 3-0. The Varsity team ended their home matches with a thrilling 3-1 win over Pinnacle Classical Academy on Senior Night, where the two Seniors; Becca Scholes and Cassie Brondolo, were honored. 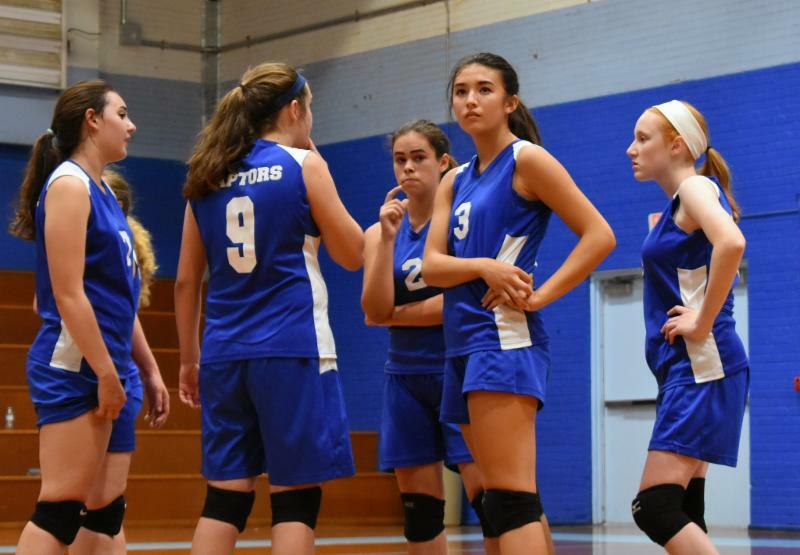 The Volleyball season is not over yet! The teams will find out their fate over Fall Break as to their seeding for the C.S.A.A. State Tournament. The Varsity team will also compete in the W.P.A.C. Conference tournament on October 26th and October 27th at the Spindale House. Come out and cheer the girls on! We had a great first 6 weeks and we are looking forward to the next! Thank you for your support and for being a Raptor! We studied astronomy, earth as a system in space, and the earth’s relationship with the sun and the moon. We then moved on to study plate tectonics and how the theory explains volcanoes and earthquakes. 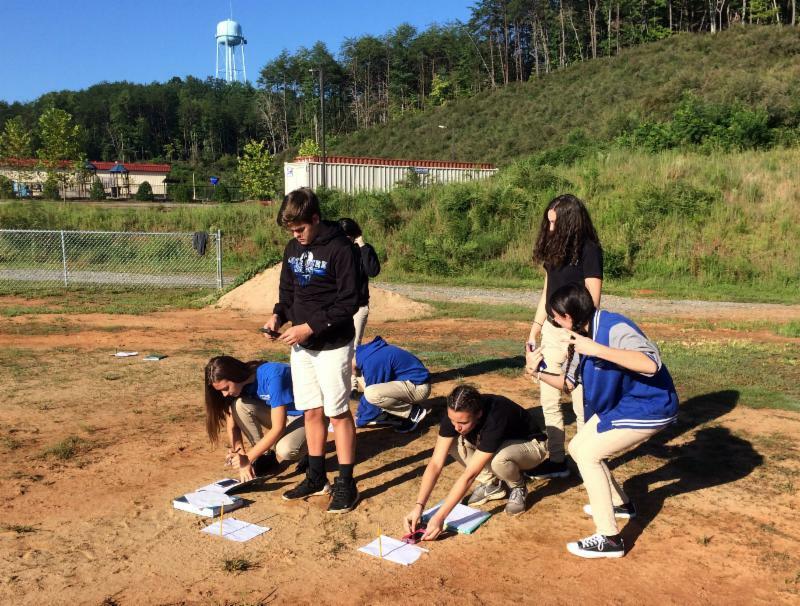 Students did planet models and performed a sundial lab. We studied cells as living organisms and the building blocks of life. We then ventured into a study of ecosystems and the ecological functions of organisms. Students performed a lab where they measured pill bugs and the time it takes for them to uncoil when they roll into a ball. They also made edible cells. 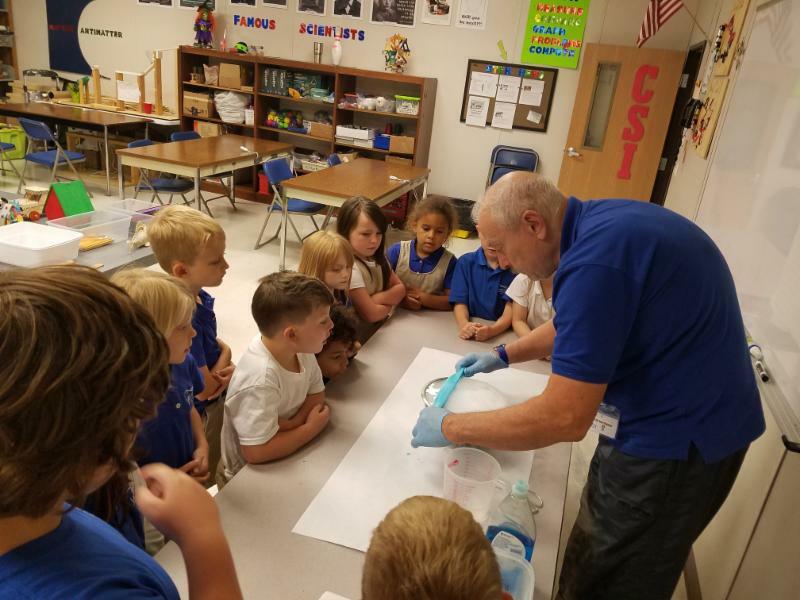 Students were introduced to microscopes where they looked at pond water, cheek cells, and onion cells. We practiced our observational skills. Students learned about the anatomy and physiology of plants. 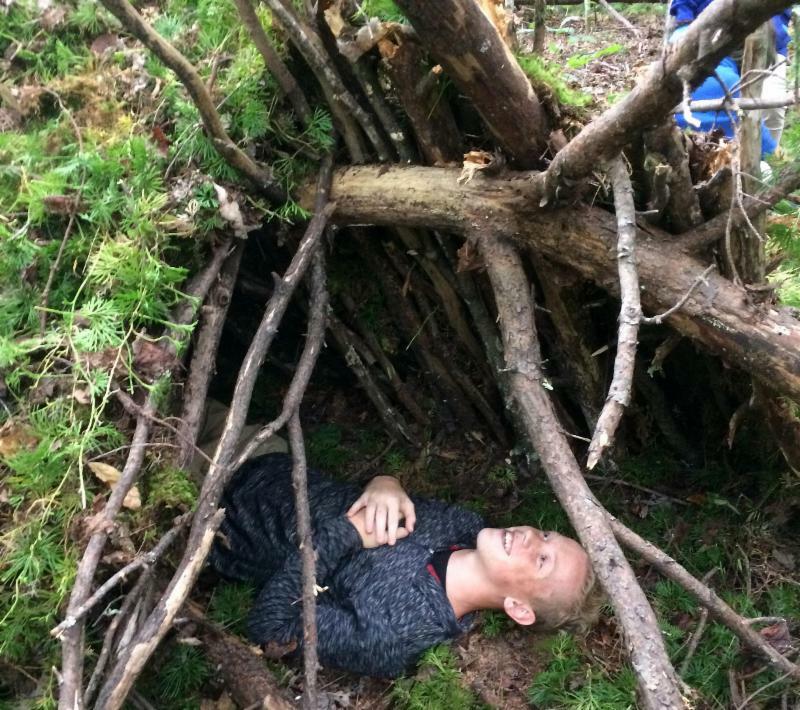 We learned about maps and how to use a compass as well as basic hiking skills, emergency shelter building, and basic knot tying. 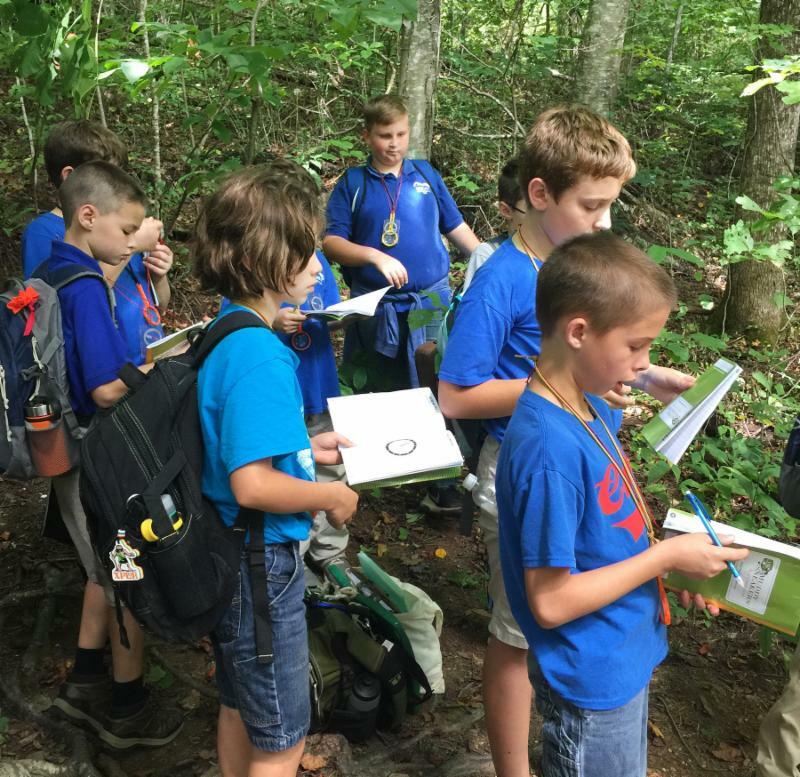 Projects that were assigned were a leaf collection, a Hickory Nut Gorge plant research project, and a Hickory Nut Gorge animal research project. The first six weeks of high school PE have been great! We have enjoyed great weather (for the most part), and the students have done well getting back into "school mode" after summer break. We have covered two units of PE, Volleyball and Basketball. We have also covered two units of Health, "Your Total Health" and "Taking Charge of Your Health." In these two units, we discussed a variety of topics, including; decision-making skills, influences on your health, your social environment, risk factors, and lifestyle choices. 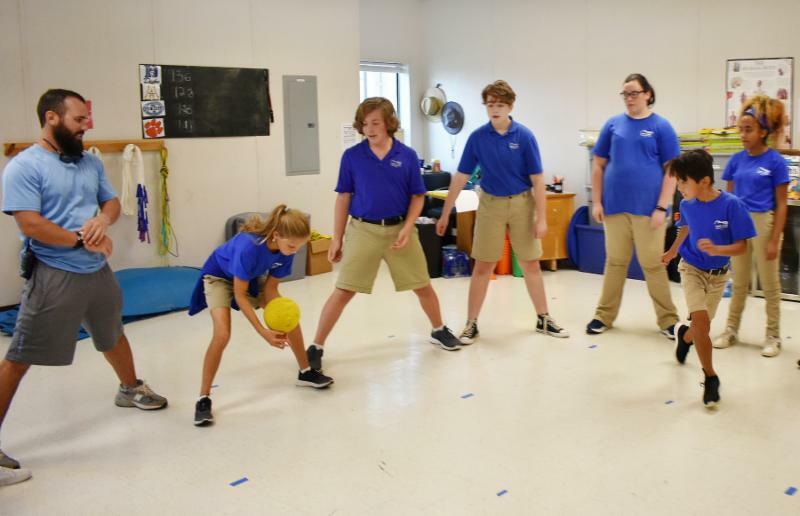 The students have done excellent adjusting to the back-and-forth switches of PE and Health class. 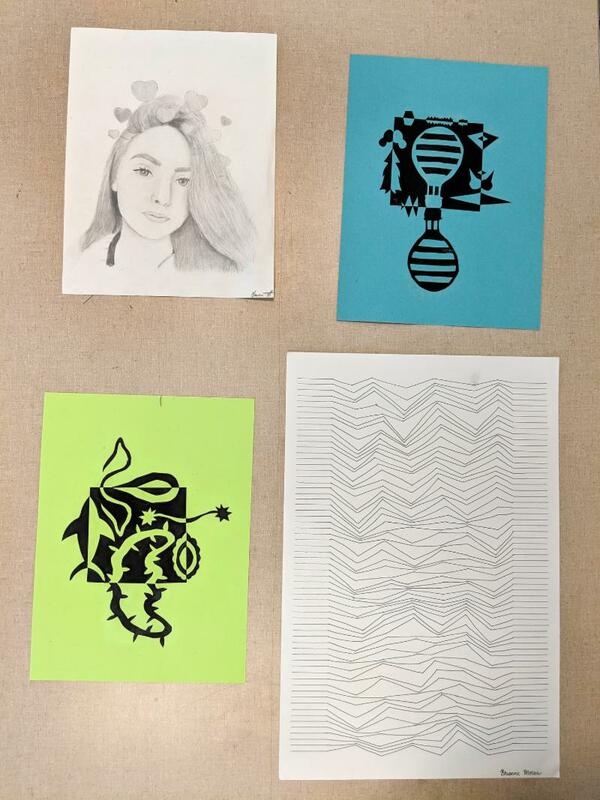 HS Visual Arts: The students have been studying the elements of art and principles of design through the exploration of various media to create artworks. Above are some of the artworks, including tesselations, which explore color, shape, and the principles of variety and pattern, non-objective line drawings which explore line and the principles of movement and harmony; exploding boxes; which explore shape, space, and the principle of balance; and 'filtered' self-portraits; which explore shape, space, value, and the principles of balance, proportion, and harmony. HS Theatre: The past six weeks of HS Theatre class have been awesome. 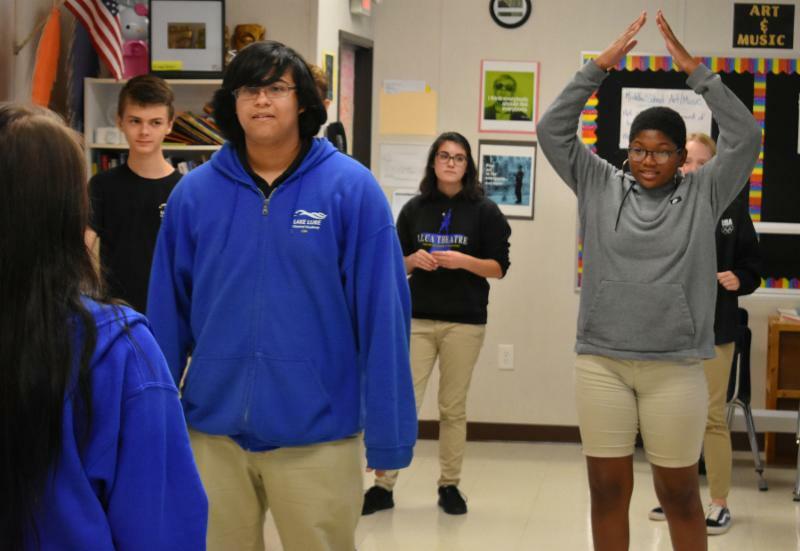 The students did a great job building ensemble, and now it's wonderful to see how much more willing they are to get up in front of their peers and take creative risks they wouldn't have tried before. After building ensemble, the students have explored improvisation, as well as character analysis and script writing. 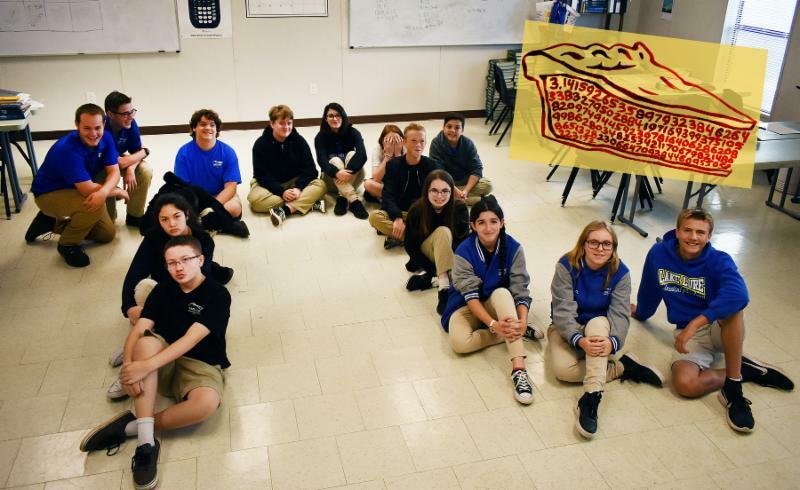 Two out of the three scripts that are going to be performed in a night of one-act performances at the Mill Spring Agricultural Center (on October 27th at 5:30 pm) have been written by the students. It's so exciting to see a play one has written actually be performed, and I'm excited for the students to be able to show off their hard work when they perform their pieces. One of the three plays will be chosen to go to the NCTC High School Play Festival on November 2nd and 3rd at Gardner-Webb University. All are welcome to attend both the one-act performances and NCTC. Donations will be requested at the door at the Ag Center and NCTC is free to attend. 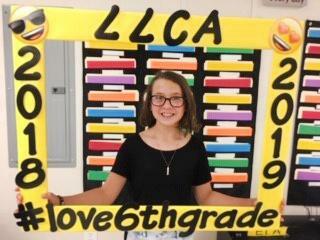 It's been an extraordinary six weeks for the math program here at LLCA. First of all, having Ms. Nidiffer on the team has been a blessing. We've been focused this six weeks on removing the myths about what it takes to be an extraordinary results producer. It's not about intelligence; it's not about natural gifts. If we're not producing extraordinary results, we're either not doing the work, or we're not doing the right work. The rest is a story we use to justify not doing the work. Congratulations to them. Thank you all! We had an excellent first 6 weeks in Chemistry, Advanced Functions and Personal Finance. Major applause to all the students for their hard work. We have made great progress! African-American Music History: The first six-week grading period saw these students learning about indigenous music from Africa and how it culturally influenced early African Americans. 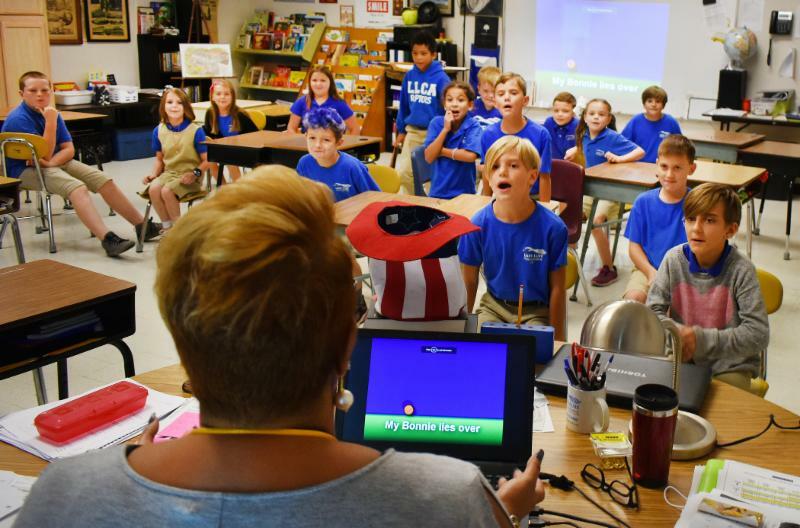 Next they gained an understanding of the cultural significance of early African-American work songs and spirituals before studying blues music of the Mississippi River Delta. After fall break this class will continue its study of Jazz music. 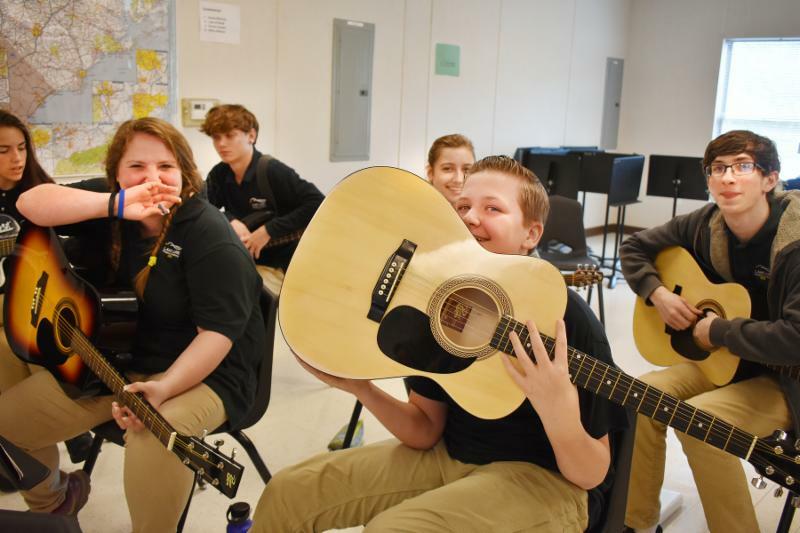 North Carolina Music History: The first six week grading period saw these students learning about Scots-Irish history and culture and its relationships to Western North Carolina. After the break they will begin learning about early Country Music and its connection to Asheville and Bristol, TN. 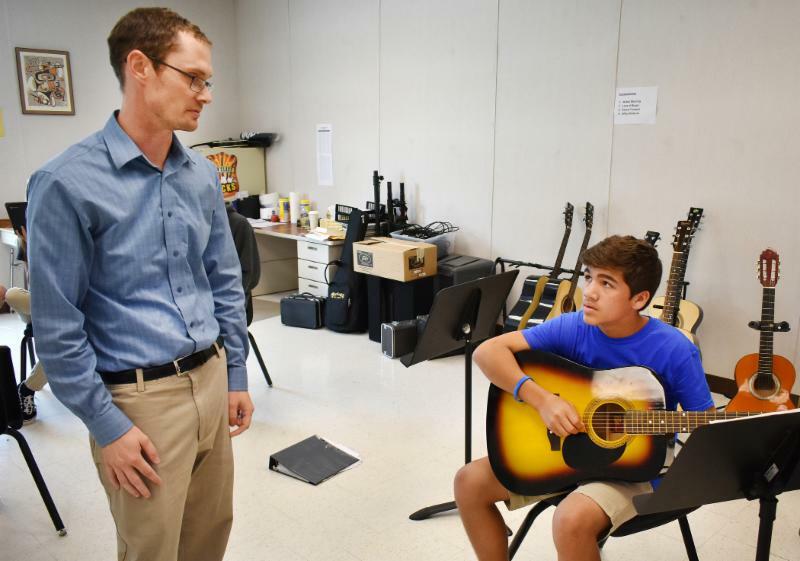 High School Guitar: Students in this class spent the first six weeks learning proper instrument technique while honing their sight reading skills. They also studied beginning music theory and basic rhythm counting. After the break these students will begin composing original songs in the key of G Major. 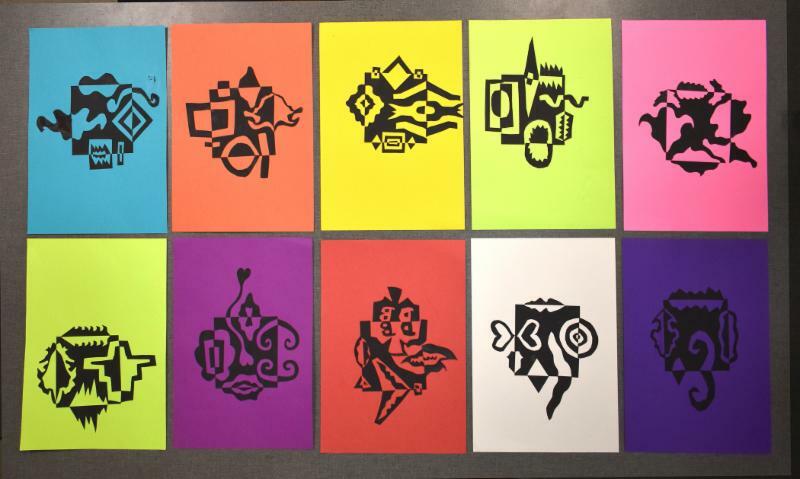 English IV: For the first six weeks, students studied Beowulf, The Illiad, Sir Gawain and the Green Knight. They wrote raps, did board games, wrote essays, and completed artistic representations of swords, and also created a Beowulf bulletin board. English II: Students studied fairy tales and fables and Chinese and Japanese literature. 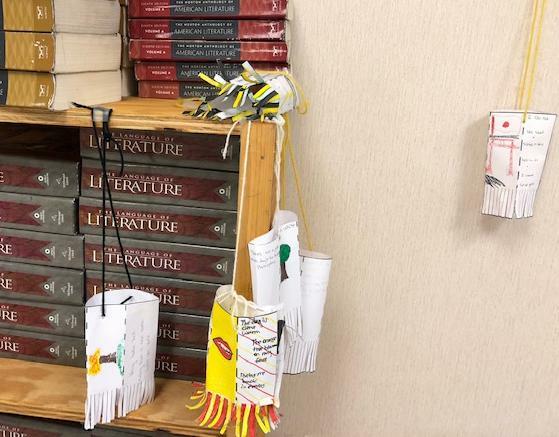 They wrote their own fairy tales, did a lesson plan with presentations of archetypes, wrote and performed their own quests, made Chinese paper lanterns, and wrote and performed their own Japanese Noh theatre pieces. Spanish I: We learned how to greet one another in Spanish as well as the beginning of forming sentences. We also learned the concepts of family, school, and how to describe people in Spanish. 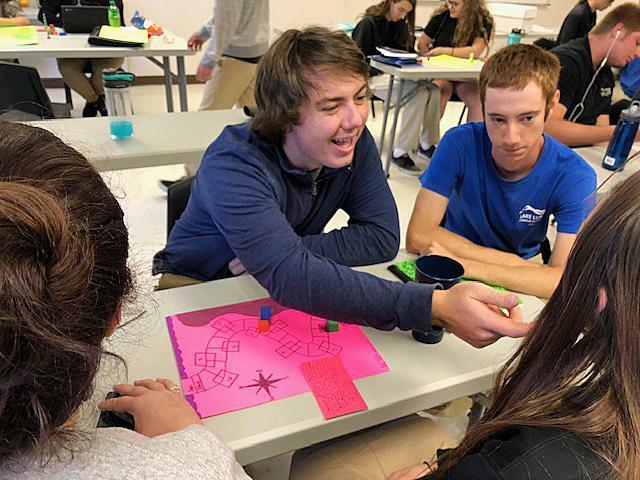 Spanish II: We learned the start of forming sentences and conjugating verbs, and we studied the concepts of school, describing appearances, and daily routines. Civics: Students have had an awesome start to the year! They have learned many amazing things. Students have studied various current events, articles, documents and how our government got its start. Students studied many documents in great detail, such as the Constitution, Declaration of Independence, and many Supreme Court Cases. These students were able to use these documents and relate them to their daily lives. Students have also taken a close look at their U.S. Congressmen. Students studied and researched various legislation that interested them. Students gained copious amounts of information in relation to theirSenators and House of Representative members. I am looking forward to another successful and effective six weeks! various documents such as the Declaration of Independence and the Constitution. Students have used these documents to help them understand the timeline of American History 1 from its beginning to the turn of the 19th Century. Students have also studied these documents to make references to their daily lives and how these documents impact them from day-to-day. 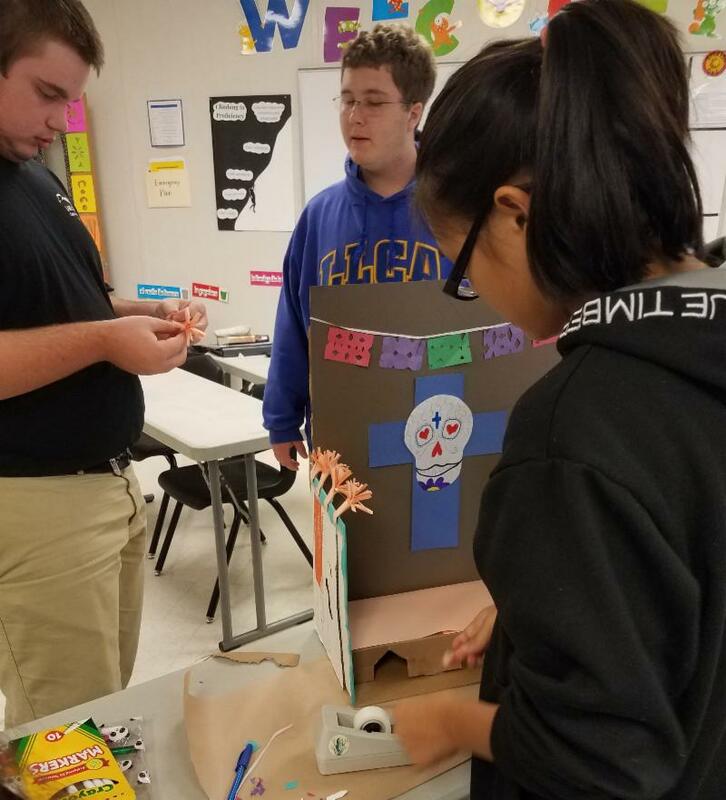 World History: World History students studied ancient humans through the beginnings of early civilizations and empires. The students worked individually and in groups on various projects. Each student was part of a group project presentation at the end of the six weeks. I'm proud of the work and progress of all the World History students this six weeks. Journalism: Students wrote on a variety of topics and gave their personal responses and reflections. Students examined newspaper articles and wrote their own. Journalism students completed an interview project and presented projects to the class. They also wrote their autobiographies. The six weeks ended with each student writing a personal perspective on a chosen topic that will be submitted to The Mountain Breeze for possible publication. I enjoy the enthusiasm of all the students in this class. English I: English I students kept daily writing journals and daily reading journals. The students completed a short story unit reading and analyzing a variety of stories. 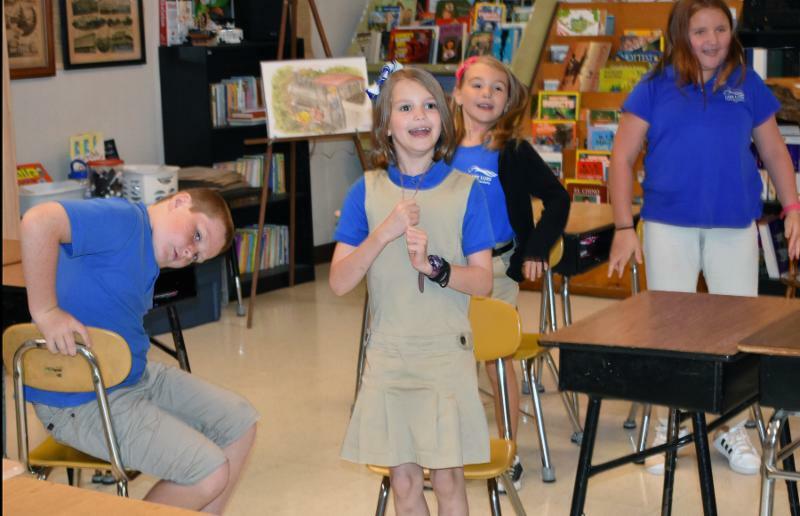 Students worked in groups to complete and present various activities related to the stories. English I students wrote their own narrative endings to a short story. I am proud of all the students and their work this six weeks. 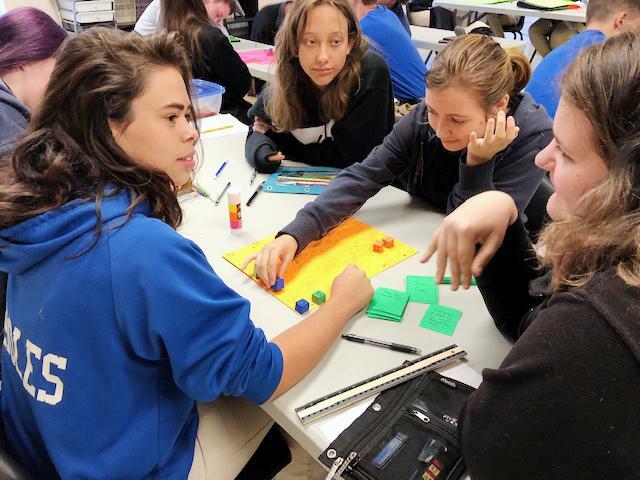 Field trips and FAFSAs and applications, oh my! I'm so thankful to have the opportunity to work with your students, and I have greatly enjoyed starting the process of getting to know them over the past six weeks! 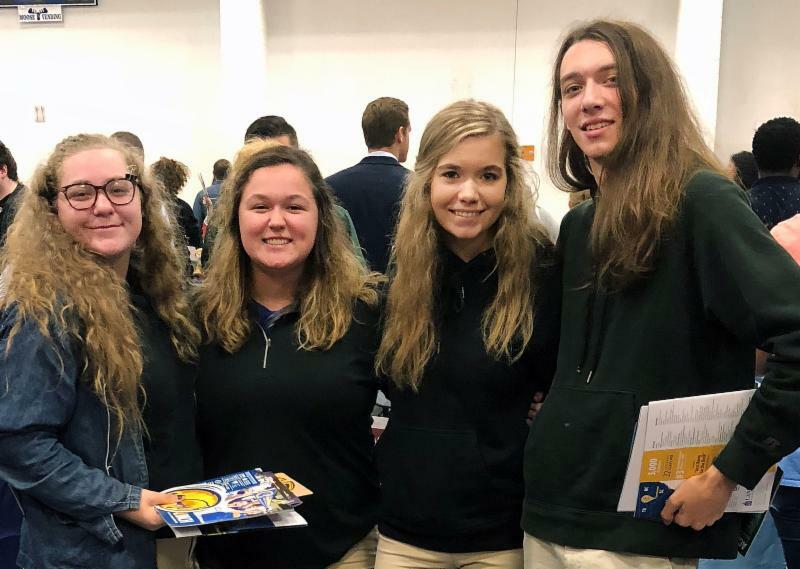 I have had the opportunity to go on team-building field trips with the middle school, teach classes at both the middle and high school levels, bring college representatives to speak to our Juniors and Seniors, and take those students to a college fair at Isothermal Community College. 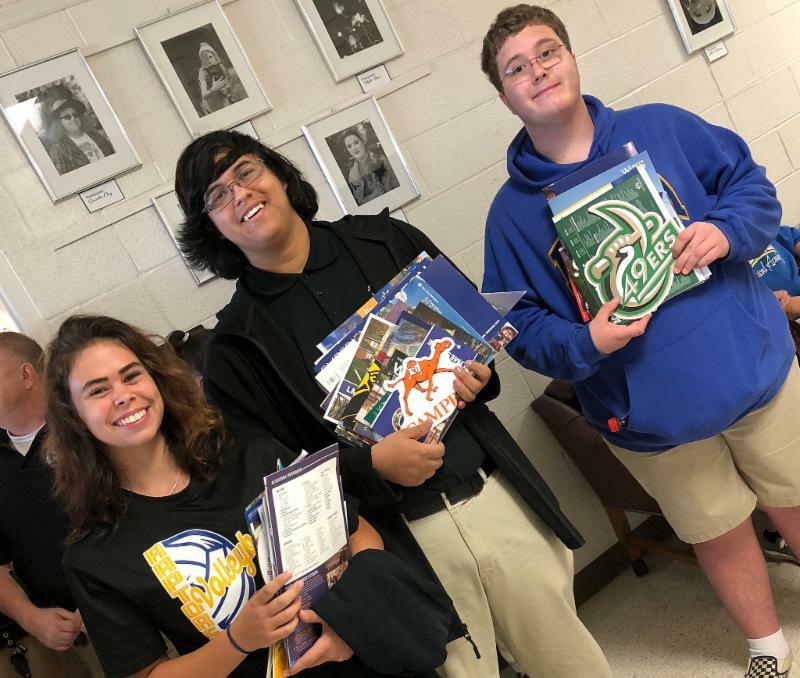 I have built up my library of college materials to better serve our high school students looking to extend their education beyond the walls of LLCA. I have begun teaching the 8th grade groups during 5th period each day. I cannot wait to see what careers they choose to explore, research, and present to their peers. With the help of Ms. Nidiffer, we are also hosting LLCA's first ever College Application Bonanza Week for our Senior class the week after Fall Break! 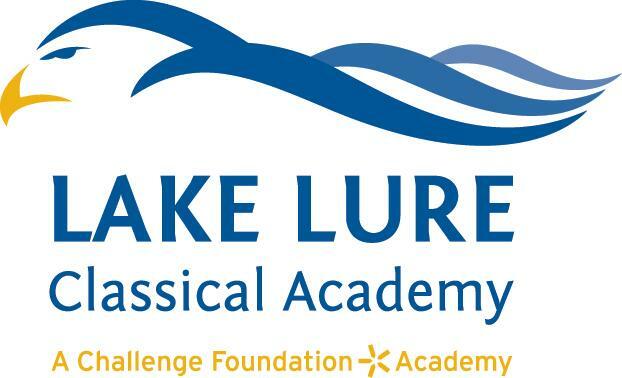 Information should have been brought home already, but you can also find all of the details on my teacher page of the LLCA website at the link below. 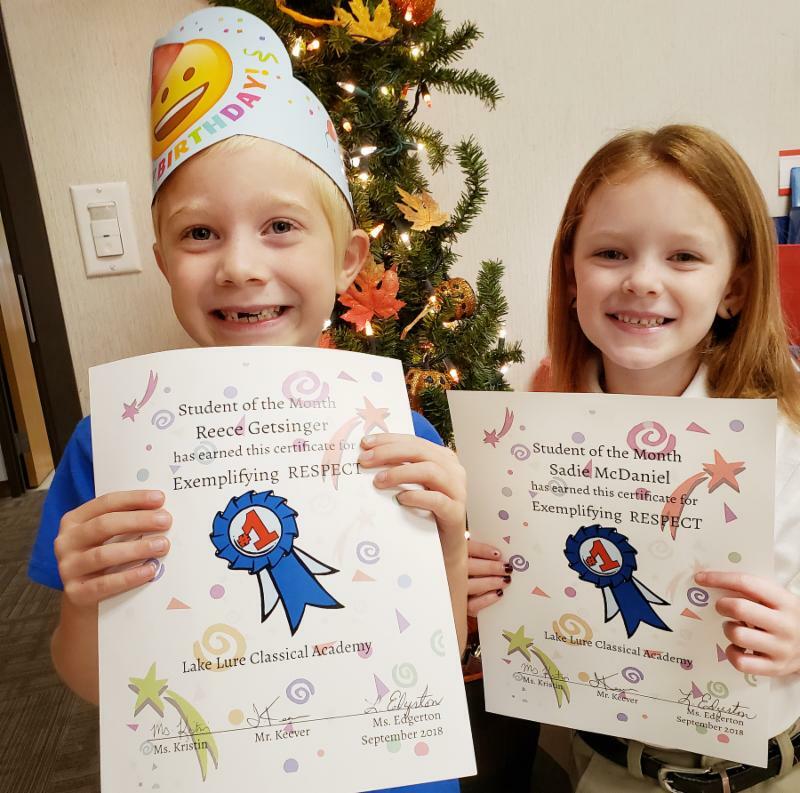 We're on a roll with a fantastic school year so far. Let's keep it going! This six weeks in PE we were able to fit in a great deal of sports as well as fitness testing. 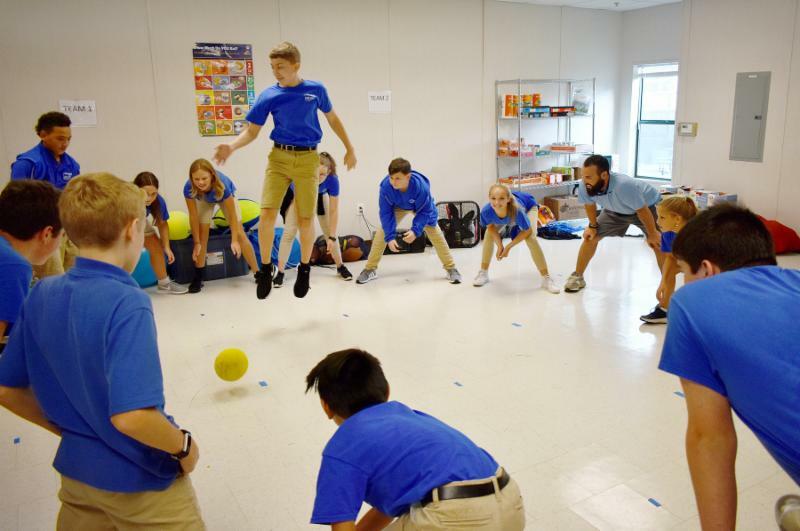 Students focused on volleyball, basketball, soccer and wiffle ball. With hopes that our soccer field and baseball field grass coming in good, we plan to get on the fields and do flag football, handball and full games of soccer. Students shown great improvements from last year in fitness testing (push up, curl up, cardio, speed and long jump) and soon we will talk about setting realistic goals and how we can achieve them through discipline and hard work. 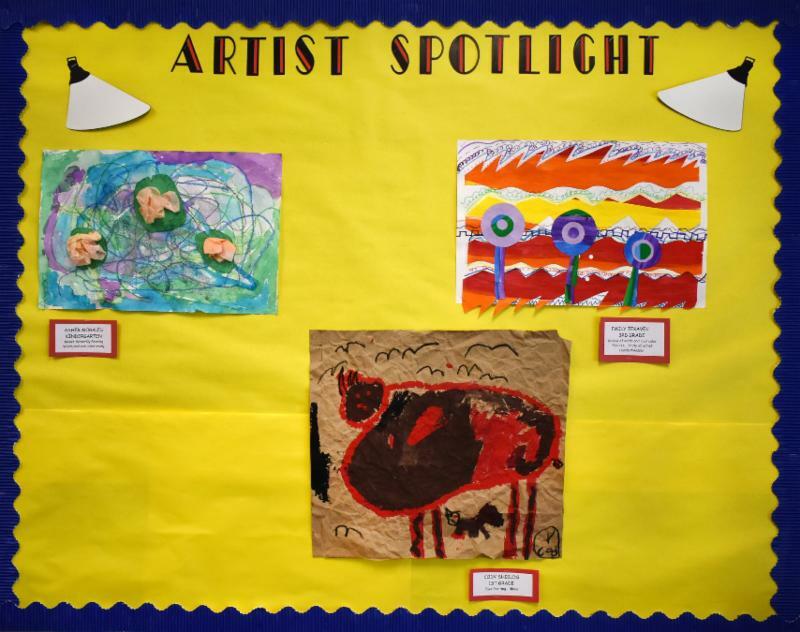 Art: The last six weeks have been chock full of imagination, creativity, and learning! 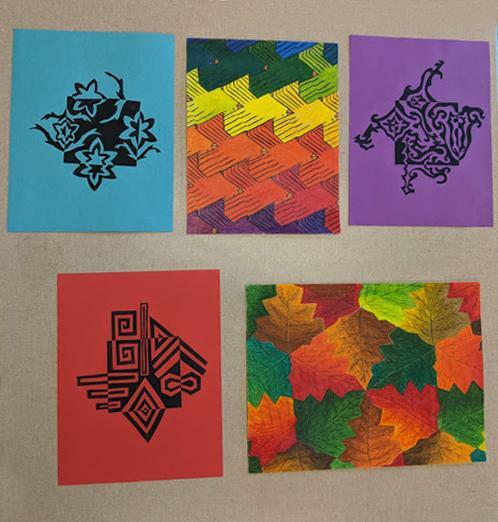 In 7th grade Art and Music, the students have learned about the elements of art and used various media to create abstract line designs in the style of Frank Lloyd Wright's Arts and Crafts stained glass windows, as well as learning about value and color to create their graffiti-style names. Music: In Music, the students have learned how to write notes on the treble and bass cleff staves and played note bingo to solidify their understanding of where the correct notes are placed. The Bear Wallow Mountain Hike. In English we have analyzed short stories, written personal narrative essays, learned 40 SAT words through Vocabulary Workshop Units 1 and 2, began units for Jack London’s novel, The Call of the Wild and Ji-Li Jiang’s Red Scarf Girl , a memoir about her experiences as a child living during the time of China’s Cultural Revolution. I look forward to our second six weeks. We will learn many new things and have more adventures together! 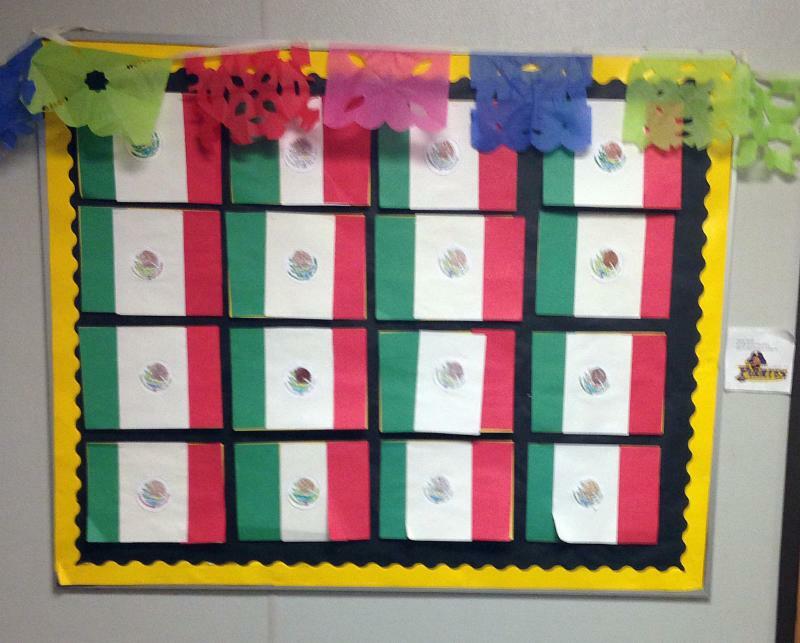 This six weeks middle school social studies students have been hard at work! 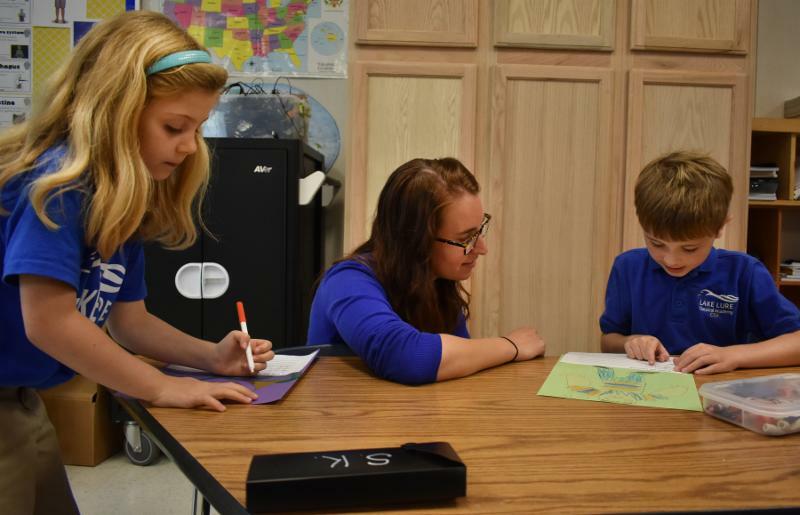 Both 7th and 8th grade started the year studying geography. 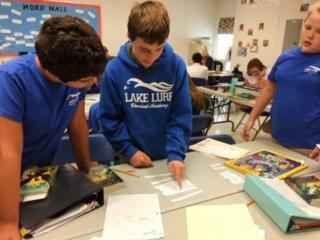 We started with looking at how the five themes of geography apply to Lake Lure. Then, students branched out to write a slideshow about how the five themes of geography applied to places they chose. 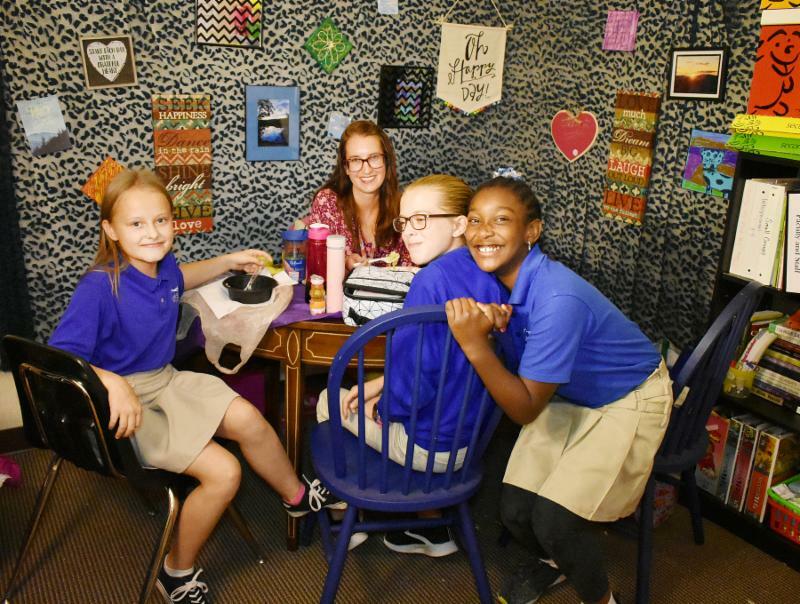 Some students chose faraway places like Paris, London, South Africa, or Australia, while others chose places more close to home like Hendersonville, Lake Adger, Forest City, or Fort Mill. Students presented these slideshows in front of their classmates as evidence of their learning. 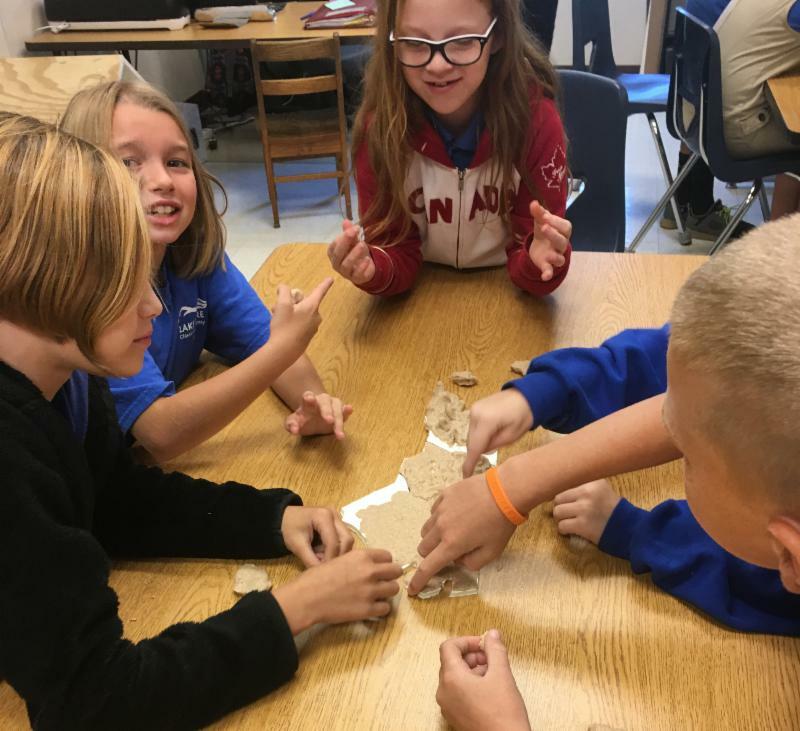 After learning the five themes of geography, students learned types of physical features on the Earth's surface, as well as major world rivers. Students practiced identifying these by doing activities like "vote with your feet" and Kahoot. We learned related geography terms, then practiced using a version of the game Headbands. We also learned the parts of a map, the types of maps, and compared maps versus globes. Later during the six weeks, we started separate units in 7th and 8th grades. 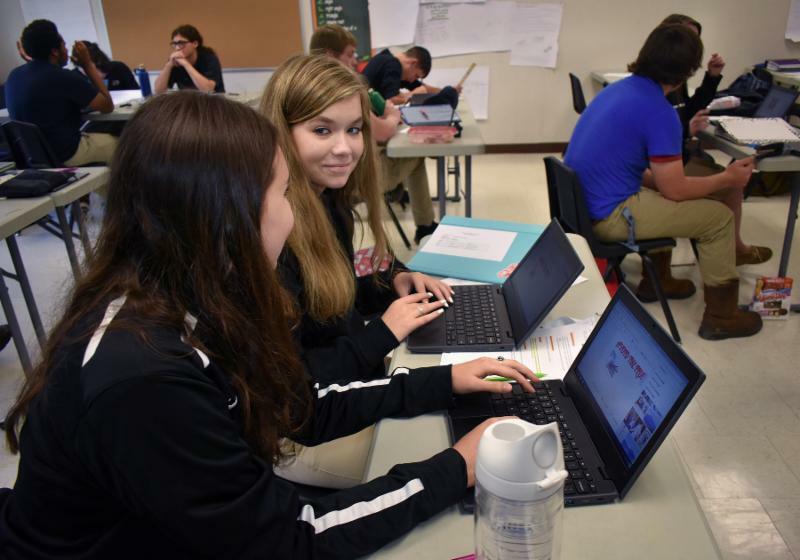 7th graders began their unit on the rise of America as a world power, while 8th graders started learning about the decline of the British Empire. During our study of America's rise as a world power, we've learned about the annexation of Hawaii through the eyes of three different perspectives: the US Navy, sugar plantation businessmen, and native Hawaiians ruled by Queen Lili'u. Using their knowledge of these different perspectives, students wrote three different journal entries, each one as if they were that type of person. Then, we looked more closely at the Spanish American War, which was also taking place during the late 1890s. Students studied about Jose Marti (leader of the Cuban Revolution), yellow journalism, Teddy Roosevelt and the Rough Riders, and the sinking of the battleship USS Maine. 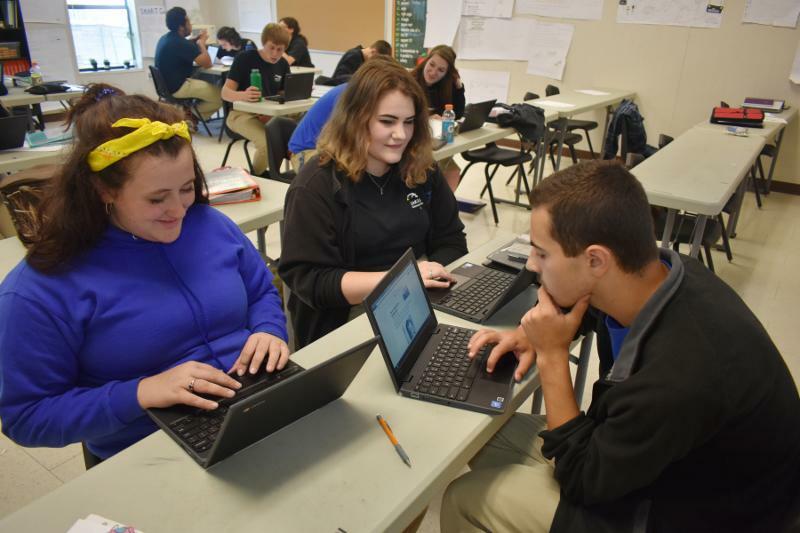 Using this information, students worked in groups to create their own newspaper, with one article being a yellow-journalism style article about the Maine, another being an editorial arguing whether Teddy Roosevelt is a hero, and one as an obituary about Jose Marti. As students finish up their newspapers on Friday, we will be continuing this unit with the study of the Philippines after the Spanish-American War and the building of the Panama Canal. In 8th grade's unit about the British Empire's decline, we studied the history of the Irish-English relationship and how this turmoil led to many attempts by the Irish to gain their independence. We specifically learned about the Easter Rebellion of 1916 because this is considered the pivotal event before Ireland gained their independence in 1921 after their war with Britain from 1919-1921. Students learned through the eyes of those who lived during this time by studying primary documents like the Irish Declaration of the Republic, the Ulster Covenant (Ulster is in Northern Ireland, and the people their were opposed to home rule), and letters written during the Easter Rebellion of 1916. After studying primary source letters, students wrote their own as if they were living in Ireland during the time of the rebellion. After Ireland, students have been studying about the decline of the British Empire in India thanks to Gandhi's nonviolence campaigns. Students read secondary sources about Gandhi life, watched biographical videos about him and read quotes from Gandhi about the importance of self control as a means for self governance and the importance of using nonviolence as a way to make change. Using this knowledge, students posted to the site FlipGrid, answering the question "How did Gandhi use civil disobedience and nonviolence as a way to push for a nonviolent India?" As students finish up their FlipGrids, we'll be continuing this unit with the study of the formation of the People's Republic of China and the geography of China. These past six weeks have been filled with lots of love, laughter, and learning. Seventh graders have learned all about ratios and proportions and are beginning to dabble in positive and negative integers. Eight graders have learned all about rational and irrational numbers, exponents and scientific notation, and are now practicing solving algebraic equations. We've also taken three field trips, all of which provided an opportunity for our students to learn, communicate, and grow as a middle school family. As we reflect on what we have already experienced, we become increasingly excited about what the future holds! We have had a great start to the year in middle school science. 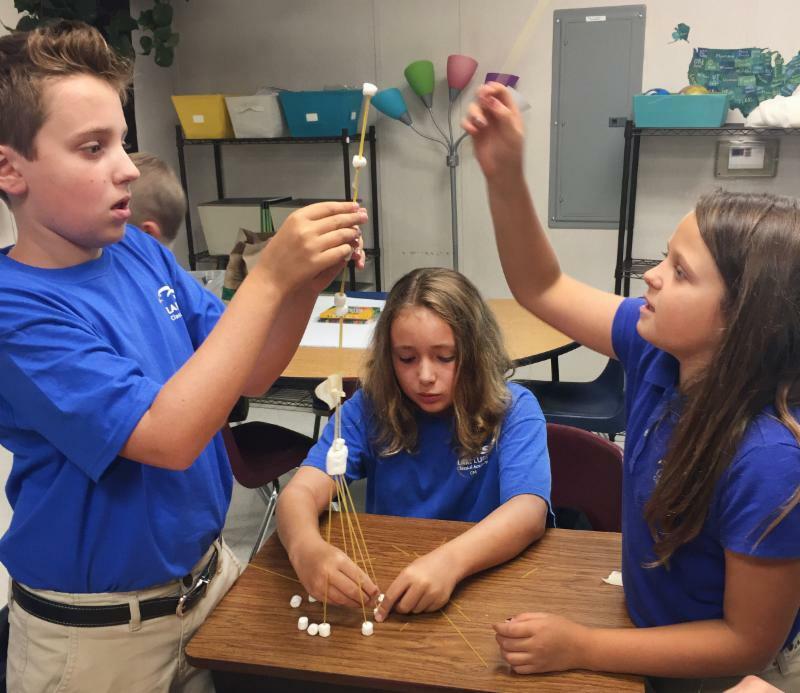 In both 7th and 8th grades, we’ve covered the basics of Scientific Inquiry and delved into specific disciplines in science as well. Seventh graders learned how and what our atmosphere is composed of. 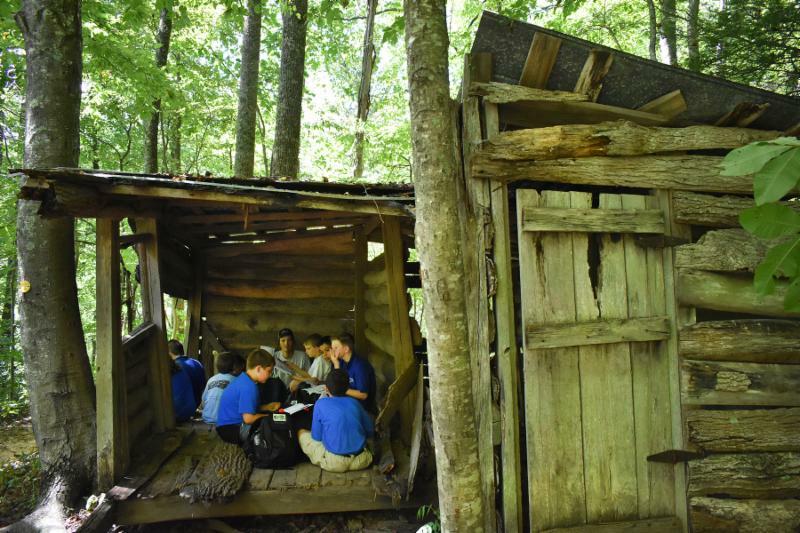 They’ve also learned about ways in which humans can affect our atmosphere and methods we can use to protect it. Students engaged in a creative project in which they made “Atmosphere Apartments.” describing each layer of the atmosphere in detail. I’m looking forward to see what this imaginary group of students will come up with next! 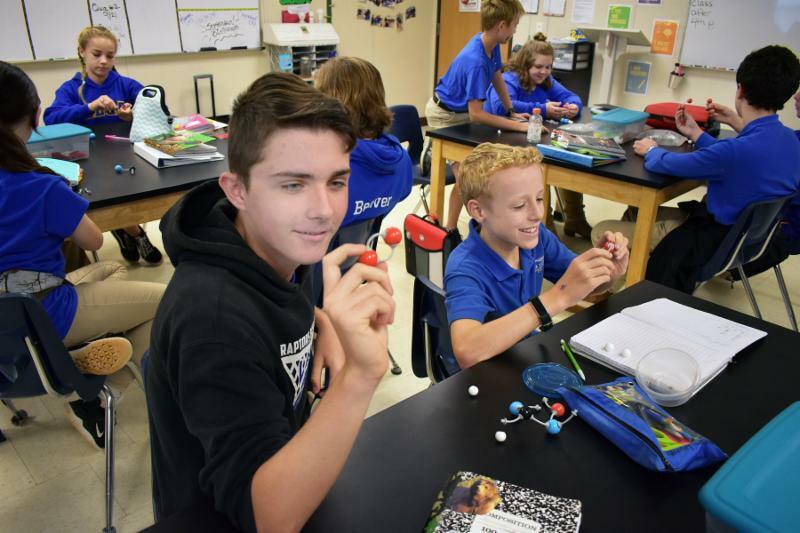 Eight graders have been focused on the amazing subject of chemistry. We’ve learned what physical and chemical properties matter has and the difference between physical and chemical changes. We discussed the structure of atoms and the history behind the atomic theory and its changes over time. Students even built their own impressive models of atoms in class! 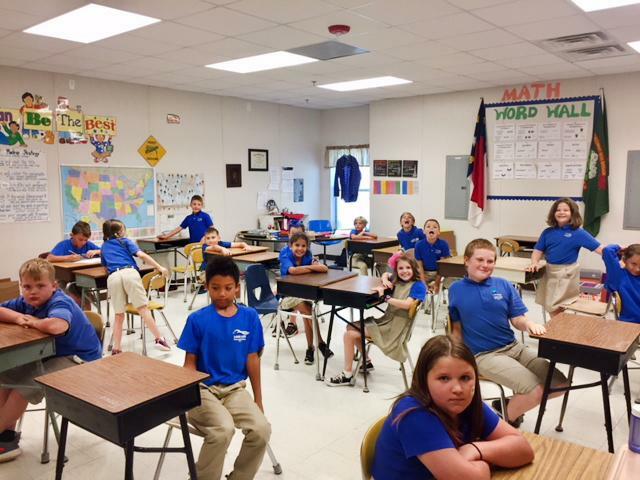 I’ve had a wonderful time being back in the classroom with your students and getting to know those who are new to our school. I’ve seen great improvements, endless imagination and a lot of hard work. I’m looking forward to a fun year ahead! It's been an exciting first marking period at LLCA. From a wonderful Kinder Camp experience for our newest students and our Open House attended by so many Raptor Families, to our amazingly smooth first day of school and successful first six weeks — we've started this year off right! We've welcomed two new sixth grade teachers, and they've both hit the ground running. And the sixth graders have done an outstanding job mentoring the younger students as our Seniors of the Elementary School . I'm so proud of the leadership they are demonstrating. I'd also like to congratulate our recently elected PTO officers: Co-Presidents Lois Khalafalla and Grace Isgitt, Vice President Mrs. Dunn, and Secretary Toni Vega. We still need to vote in a treasurer. The sixth grade had a fantastic time on our team-building field trip to the YMCA Black Mountain Ropes Challenge, where they braved climbing a 50-foot tower with the support of their classmates on the ground. 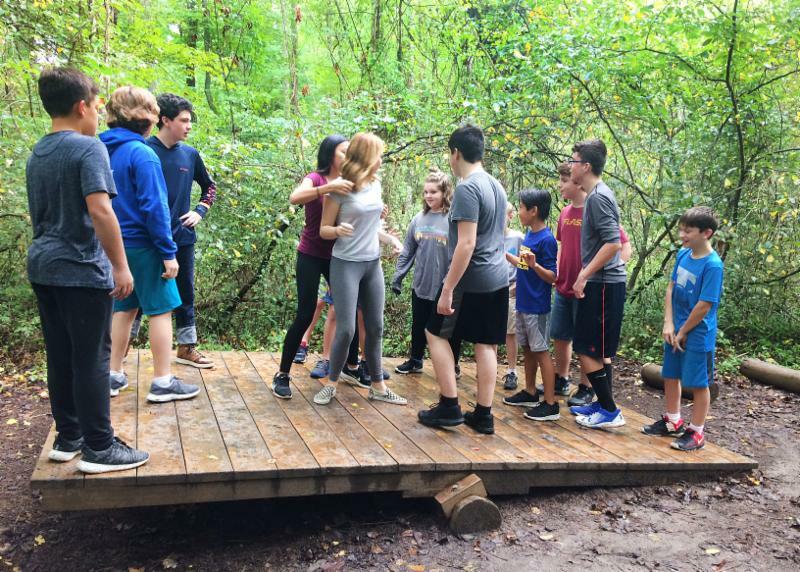 The fifth graders went on their first Muddy Sneakers expedition of the year, where they learned how to stay safe in the wilderness. The second and third graders were visited by author Linda Ragsdale, who read and signed her latest book, Peace Dragon . 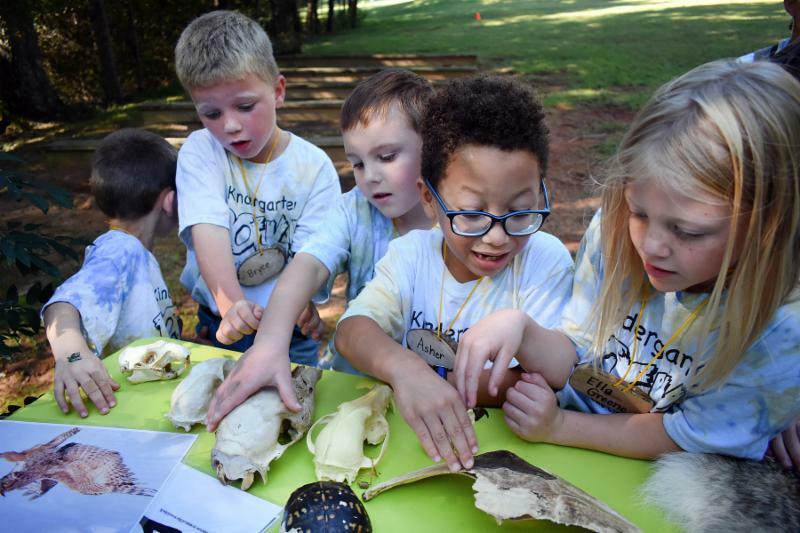 The kindergarteners had a delightful day at Chimney Rock State Park, where they learned about nocturnal animals, predators, prey, bats, and bears; enjoyed a picnic; and taking a hike on a beautiful trail. Our library is in full swing this year, with a continuously expanding inventory of great books. Our Media Specialist Mrs. Youngblood has done a fantastic job! 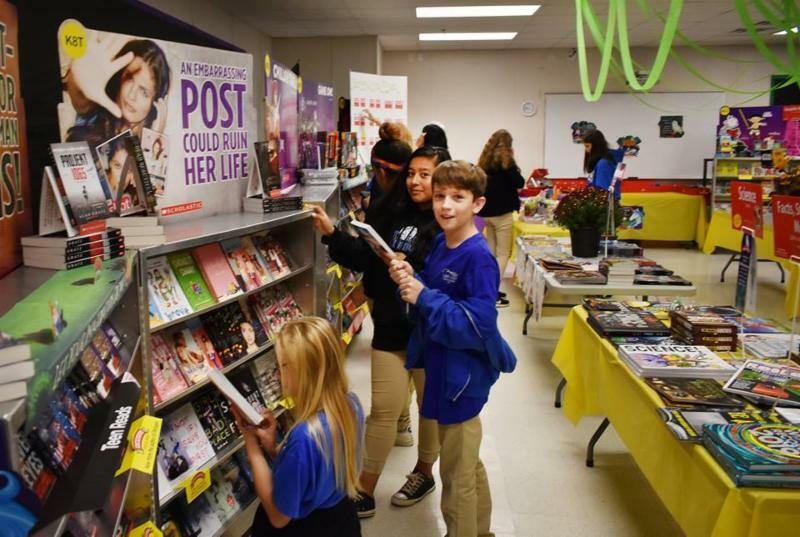 The Enchanted Book Fair she organized earlier this month was a huge success. Our new Guidance Counselor, Miss. 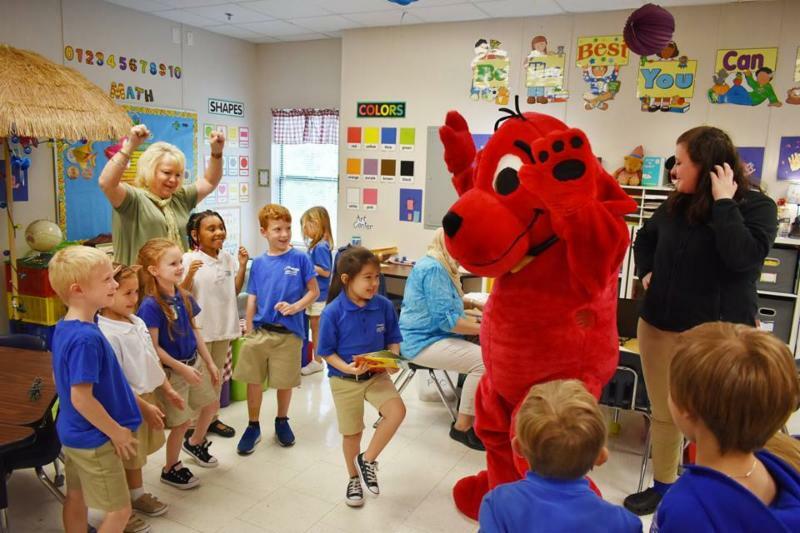 Collette, has implemented a new Character Building Program, which meets all NC state standards. 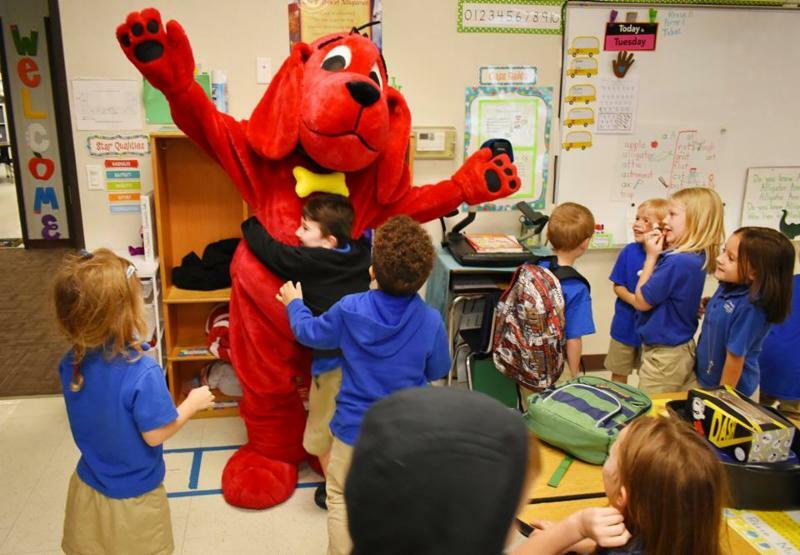 This first six weeks the children learned all about respecting themselves and others, while engaging in many creative and fun activities. We so excited about planning our first Sixth Grade dance for October 25th. Next year, we will be able to host it in our new Gymnatorium. Each day, it seems it's rapidly getting closer to completion. Thank you for your support, parents and students. 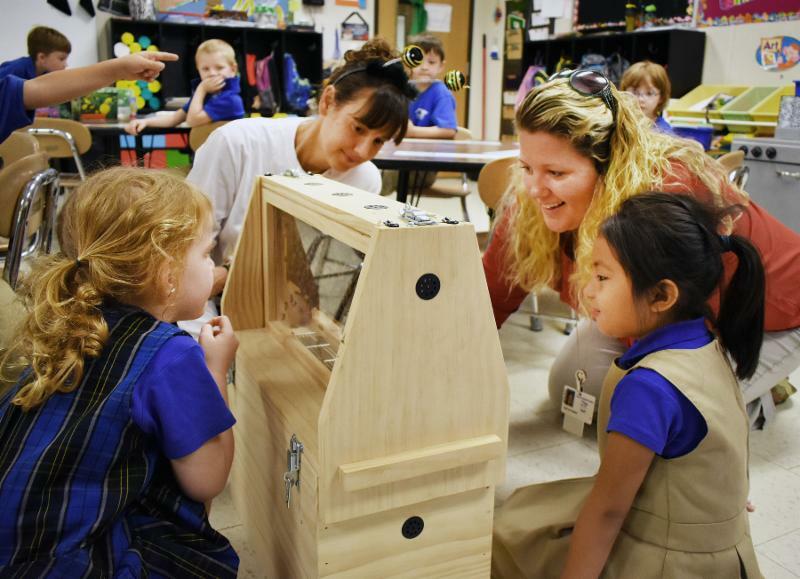 We've got a great Raptor Family working together to ensure our children's futures are bright! Third and fourth grade got off to a super start with reviewing instruments and instrument families. We then took a look at the orchestra from the perspective of Benjamin Britten. He does a remarkable job highlighting the various sections of the orchestra and the instruments in each section. We also explored the NC legends in music such as Etta Baker, Doc Watson, and Tryon’s very own Nina Simone. Fifth graders have traveled this semester in music from “Music Americana,” which was an expression of music in America to “Sakura” from Japan. Sakura is a song we learned thst is Japanese for Cherry Blossoms, which are trees celebrated in Japan during a ceremony called Hanami. 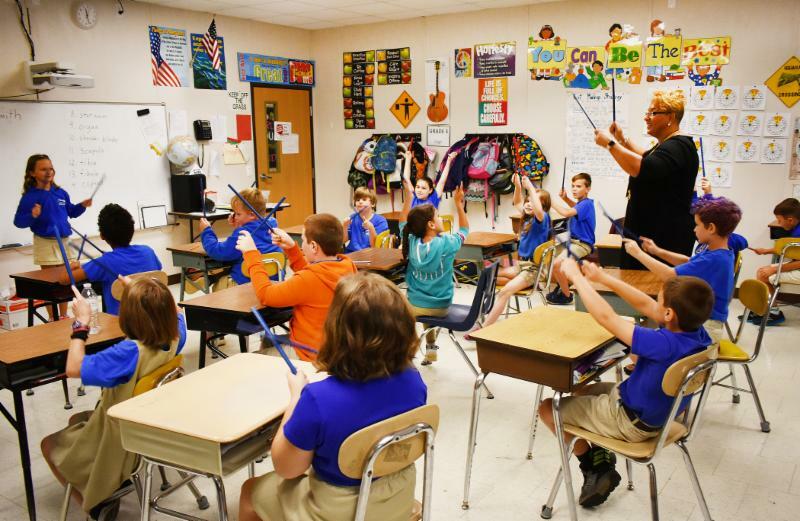 Sixth grade learned and explored music during the Baroque Era. We learned about how composers such as Bach, Handel, and Antonio Vivaldi are still influential in our music today. ﻿Music is a universal language which evokes emotion and is a powerful means of expression. I encourage you to “express yourself” with music. 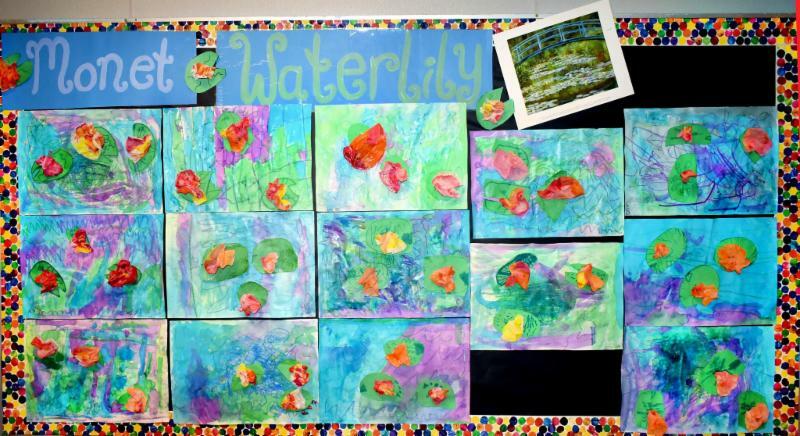 Kindergarten students learned about warm and cool color families as they created Claude Monet-inspired waterlily collages. Students used oil pastels, watercolor paint, markers, coffee filters, and green paper for their art work. We even added glitter to make the water shimmer! Students in kindergarten also learned about the super primary colors; red, yellow, and blue. Students used these colors and mixed them to make other colors like purple, green, and orange. We painted shapes like squares and circles with these colors to make a Wassily Kandinsky inspired artwork. 1st graders worked on their Art from Long Ago unit over the past six weeks. We studied the Cave Paintings of Lascaux and Ancient Egyptian Art like King Tutankhamen's Death Mask, The Pyramids of Giza, and The Great Sphinx. 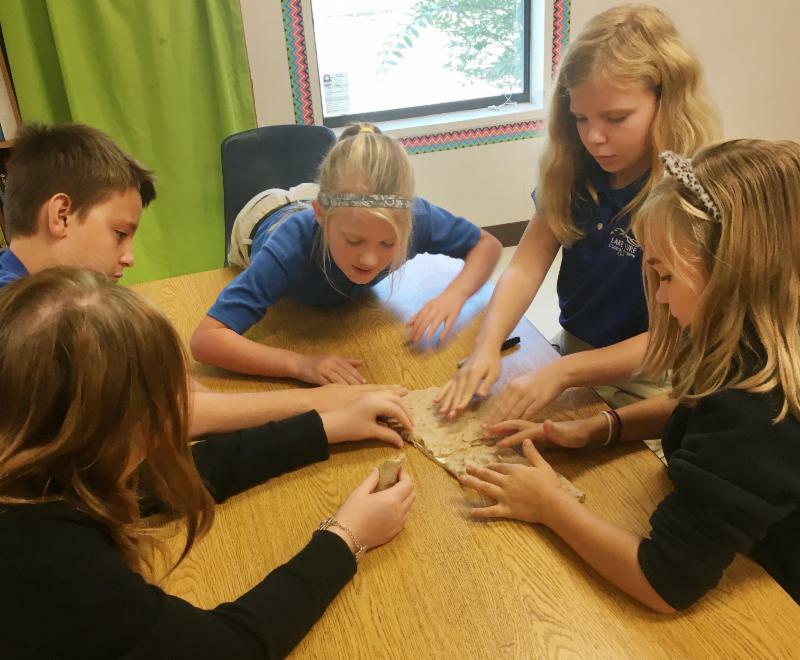 Students made a cave painting, a King Tutankhamen Death Mask, and are currently working on an Egyptian cartouche out of salt dough clay where they are making their name with hieroglyphics. 2nd Graders learned about the Element of Line, focusing on vertical, horizontal, and diagonal lines, as well as implied lines. Students created Piet Mondrian paintings using square and rectangle matte board to make prints of vertical, horizontal, and diagonal lines. Students reviewed the primary colors as they used them to paint in the shapes that were created from the crisscrossing lines in their artwork. 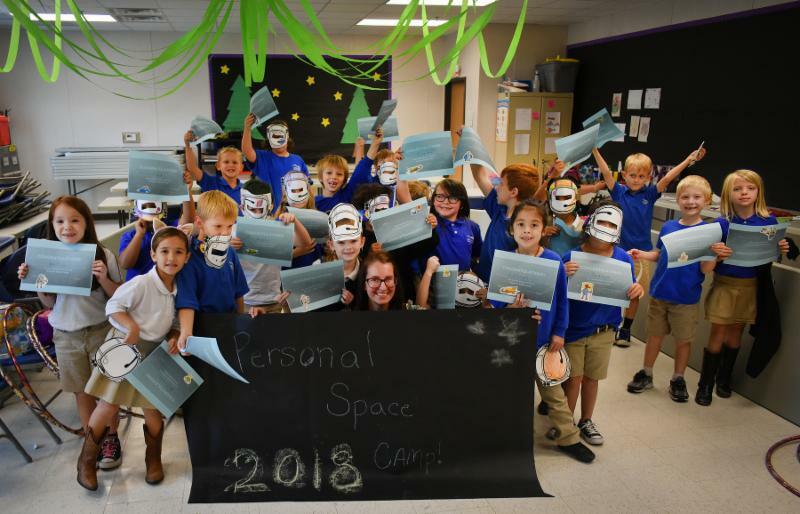 3rd Graders have been learning about the Elements of Value and Space. Students looked at the artwork titled Ruby Green Singing by James Chapin and The Gleaners by Jean-Francois Millet to study the use of value and space. 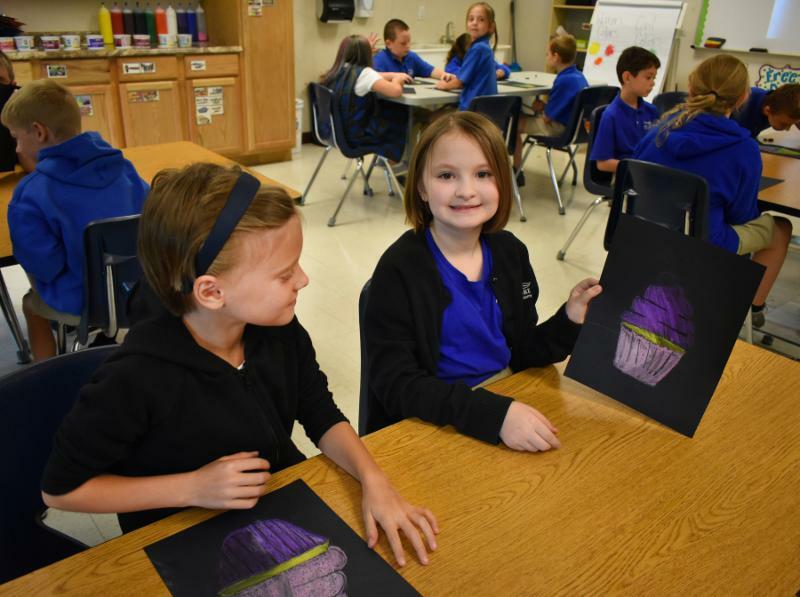 Students created cupcakes using oil pastel and a focus on having a light source to create highlights and shadows on their artwork. We also used our knowledge of creating space with overlapping, placement, details, and size to draw Starry Night Pumpkin Patches. 4th Graders have worked on several things over the past six weeks. We began our study of the art of the Middle Ages in Europe. 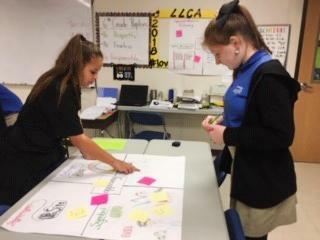 Students learned about Illuminated Manuscripts, tapestries and Madonnas. Our artists created their own illuminated manuscript for this unit. Mrs. Hutchins and Ms. Juran teamed up with me to get creative with some North Carolina topographic maps made with clay and then painted. Following our maps, students learned about the connection between farms and cities. 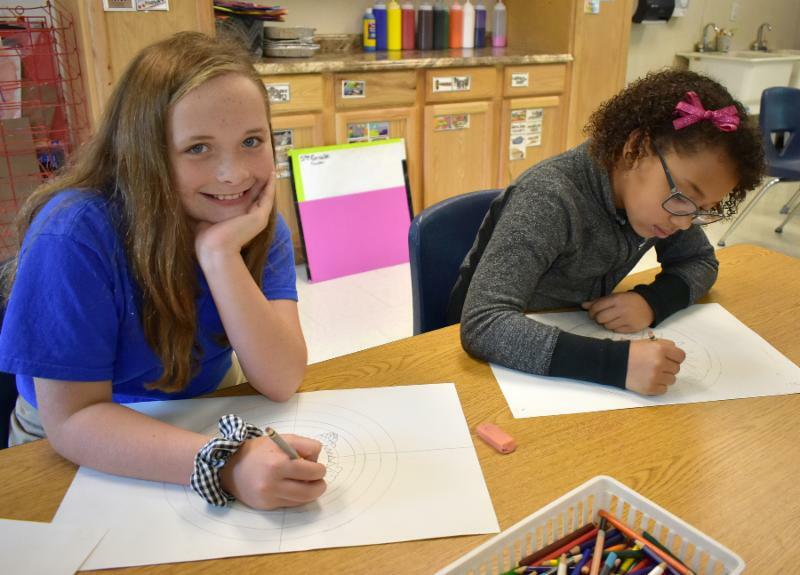 We are participating in the Farm City Connection Poster Contest for Rutherford County. 5th Graders learned about Aztec, Inca, and Mayan Civilizations. Students learned about the Aztec Sun Calendar Stone and created their own version of the calendar using an Aztec geometric style. Students also began their Inca metal work. Students have taken time to reflect on their artwork, and identify any struggles they encountered and how they overcame them. 6th Graders have been busy these last six weeks! 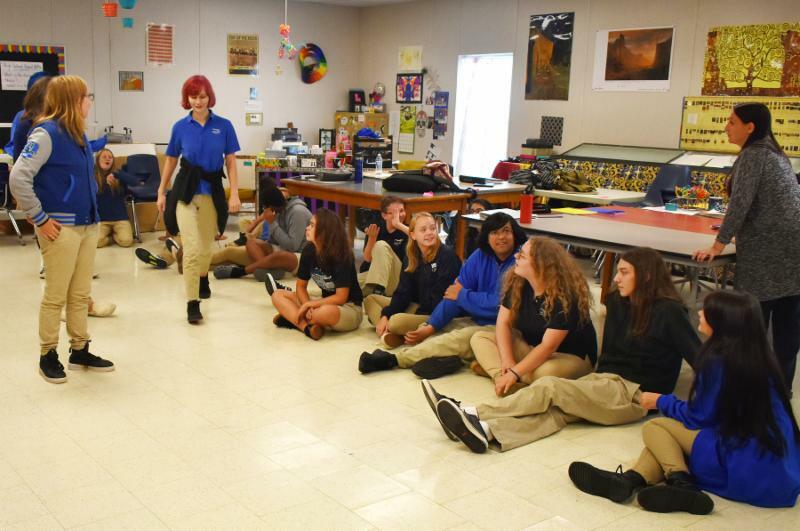 Students reviewed Roman and Greek Art with a focus on human proportions. Students were teamed up with a partner to measure their proportions and then were assigned to utilize those measurements to draw a superhero. Students completed an exercise in character development to give their superhero a story. After finishing our superhero project, we began our Middle Ages Architecture unit. In class, we briefly reviewed the key artistic forms of the time period and placing our main focus on the Gothic Architecture. 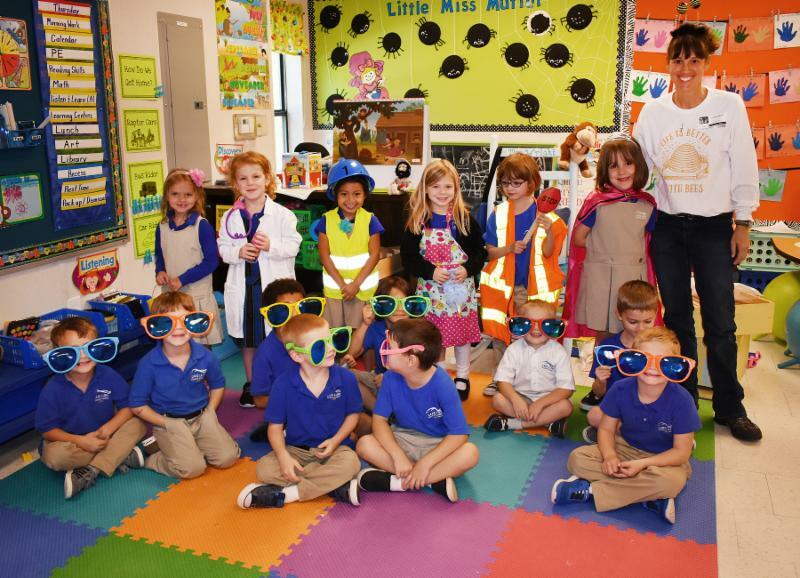 Grades K-2: The first six weeks have flown by! We have explored our own “personal” space on the playground, in the classroom, and on the basketball court. Moving safely within a specific area is a new concept to many of our younger students. We combined locomotor movements, such as galloping, hopping and jumping, with our interest in animals. Can you jump like a kangaroo or slide step like a lemur? 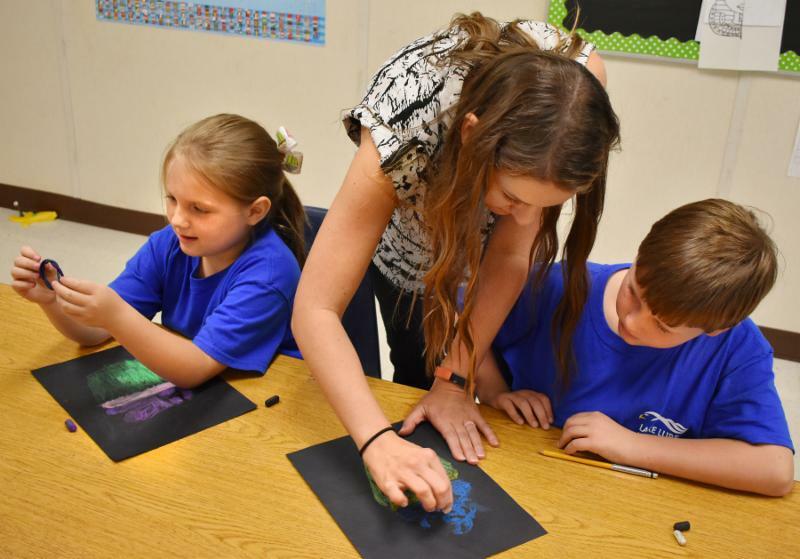 It is fun to see the creativity flow from the minds and bodies of our elementary students. 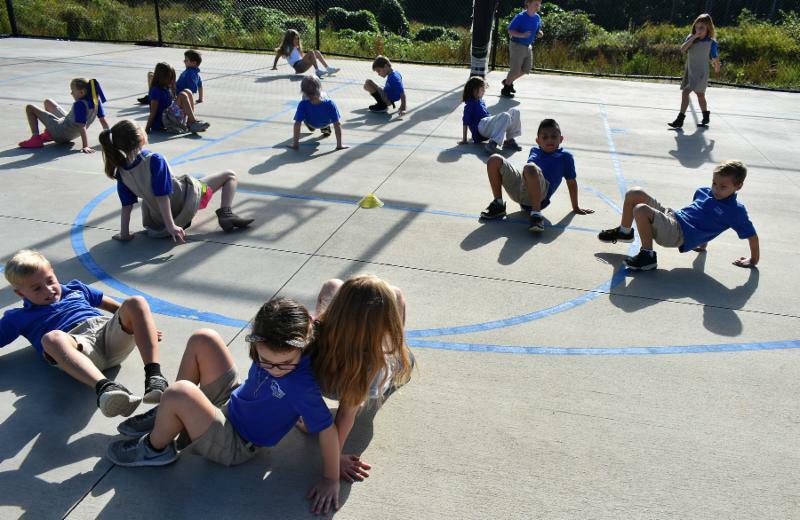 Grades 3-6: As we played games and learned new skills during the first six weeks, our older elementary students enjoyed being outdoors. We learned beginning volleyball skills by playing our own variation of wall ball and Raptor ball. The past two weeks found these grades dribbling, passing and shooting basketballs. Hand-eye coordination becomes all the “rage” as we keep those basketballs bouncing! Our kindergarten students have been busy little bees! Over the last few weeks, they have learned all about plants and pollination. We want to say a very special thank you to Mrs. Shields for a wonderful presentation on honeybees. Kindergarten ended the week with our very first field trip of the year to Chimney Rock State Park! 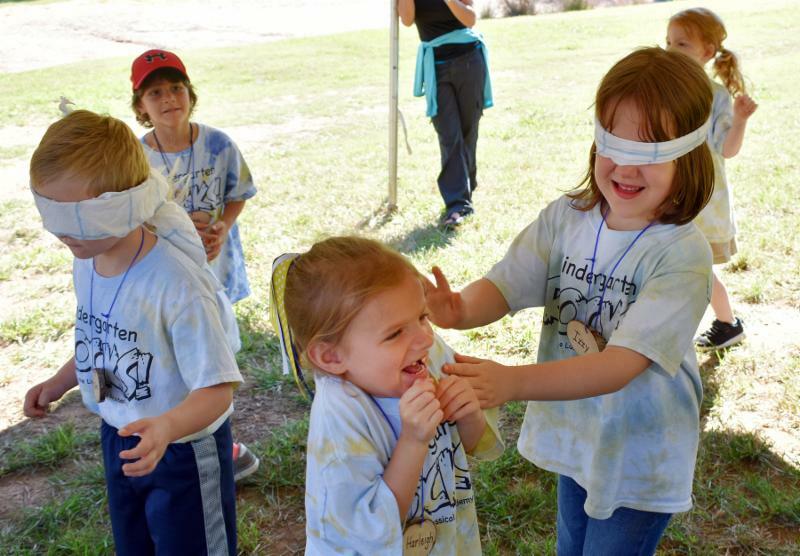 Fun was had by all as they soaked up all there is to know about nocturnal animals, predators, prey, bats, and bears. 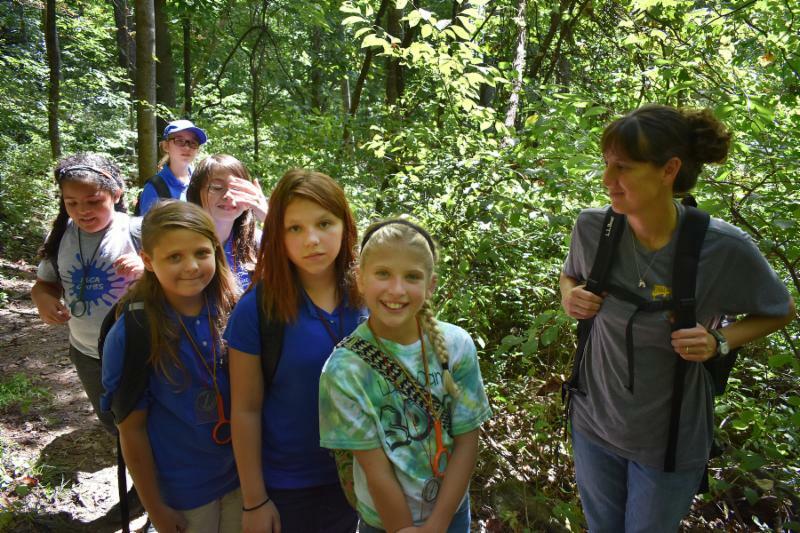 Then they enjoyed a nice little hike to search for plants and animals native to our area and test all they have learned over the past few weeks. We had such a wonderful productive first six weeks! Thank you for your support at the Book Fair. We greatly appreciate your involvement. First grade will be pushing forward in counting on to find unknown numbers in math. Math fluency is very important. Please continue to encourage your child to count and work with number bonds. We are making our way through our Snap Shots reader in our Skills unit, identifying nouns, learning about punctuation, and practicing sight words. Please work with your child in learning their sight words. This will increase their reading fluency and decrease their frustration. Our Listening and Learning will transition into a unit called, "Different Lands, Similar Stories." This unit helps introduce other versions of classic tales from other parts of the world. ﻿Our first graders are working hard and making a huge effort to grow each and every day! 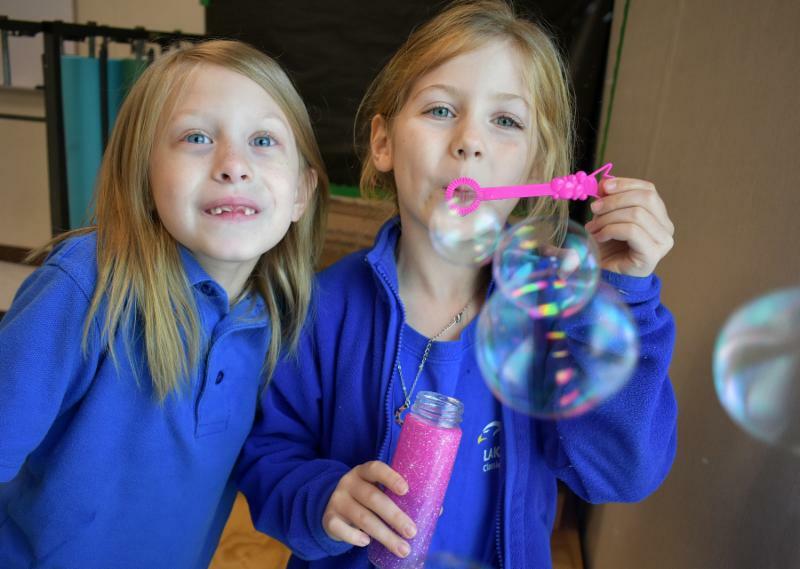 Second graders have really been learning about many different things since school began. 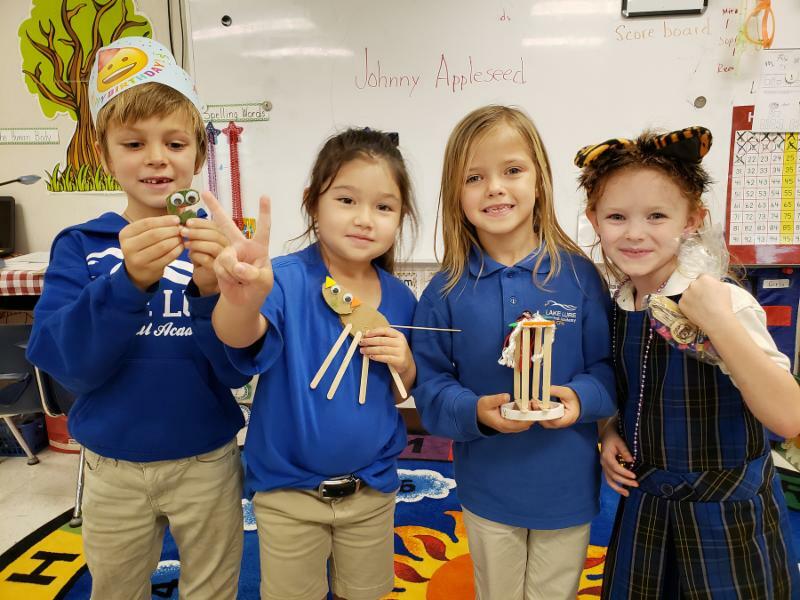 Our first domain unit was Fairy Tales and Tall Tales, where we enjoyed reading Beauty and the Beast, The Hungry Fisherman, and The Emperor and His New Clothes. We traced Tall Tale Heroes across the United States. 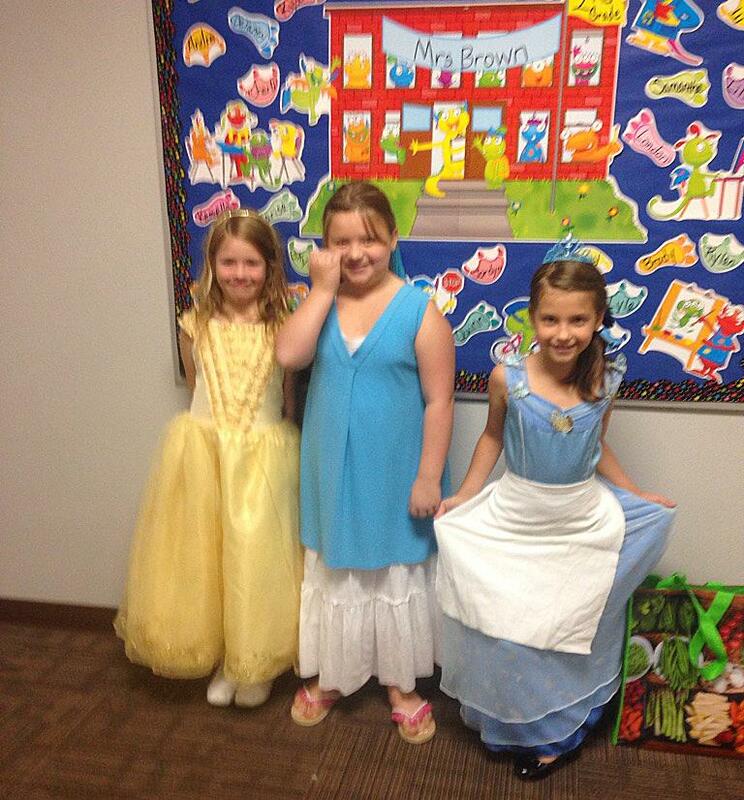 Many of the students dressed as their favorite Fairy Tale or Tall Tale character. When learning about Geography of the Americas, we had several of our parents present a program about their homeland of Mexico. 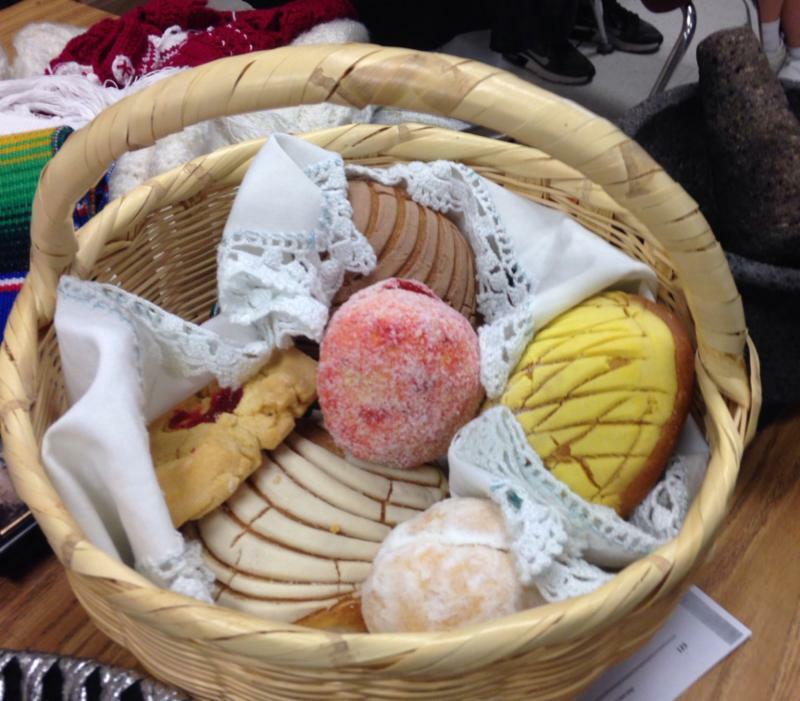 The homemade bread they brought for the students was fantastic! 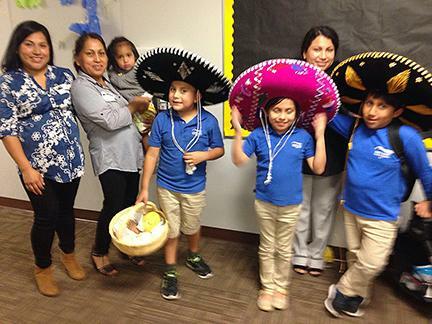 Everyone learned so much, and we always love to have our parents share in the educational process and cultural awareness. Student math teachers are proud when they wear their lanyards, I’M A STUDENT MATH TEACHER, and get to help another classmate with math concepts they have mastered. Second grade students are working on individual insect research projects using our new set of Chromebooks. Everyone is enjoying this project. 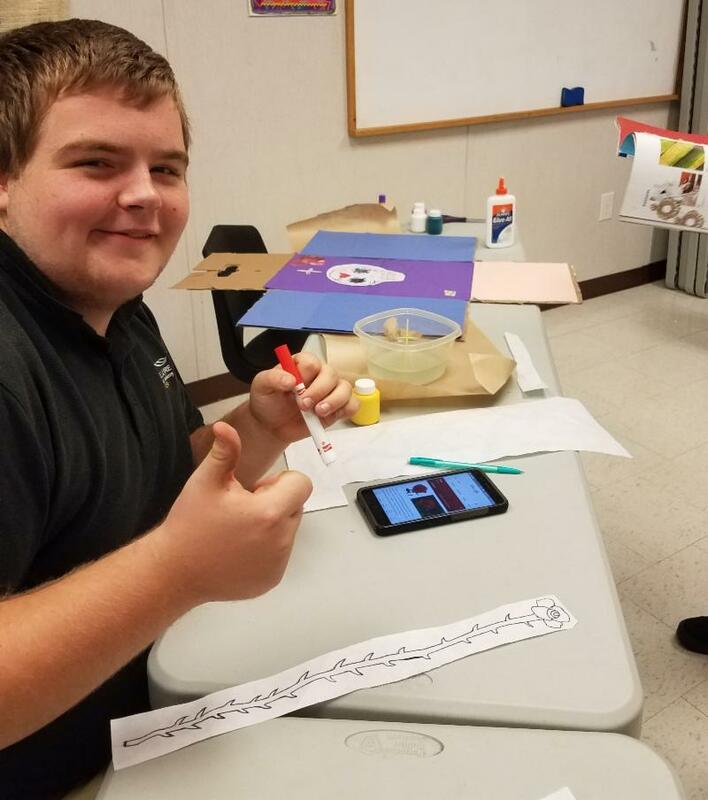 They are also working on a creative insect project made from recyclables due after Fall Break. They can’t wait to share their creative ideas! It has also been interesting to watch the construction of the Solar Project in the front of the school. The workers were very friendly and were great to tell the students what they were constructing and why. The students learned about many simple machines in the process, pulleys and augers for a few more. 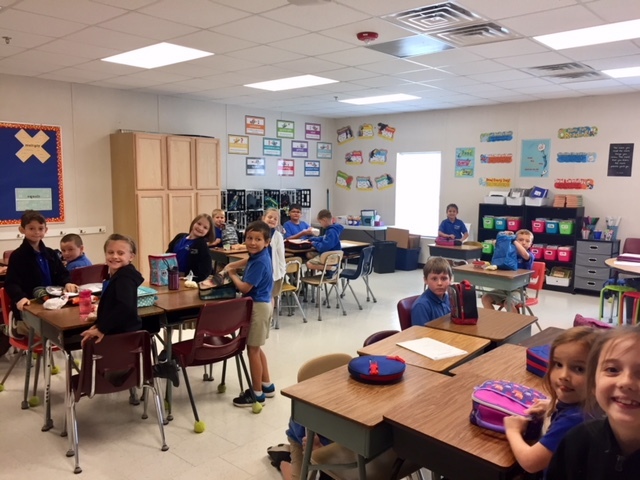 Third grade has had a very positive beginning to the year. We have done a large amount of assessments and are using those assessments to identify the needs of our students. BOG testing identified our students for Read To Achieve, and we have started working with that group remediating. 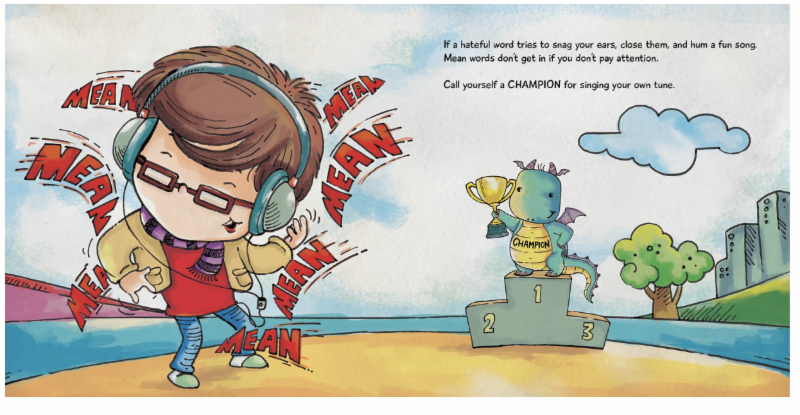 We have also identified students we need to challenge in their reading this year. We are worked hard on teaching the Markup Strategy for reading passages and answering questions. The third grade finished the unit on Classic Tales which was enjoyable to all. We are now reading about How our Body Works. In math, we worked on multiplication, and its relationship to division. We have been using the Read, Model and Write strategy in doing word problems. 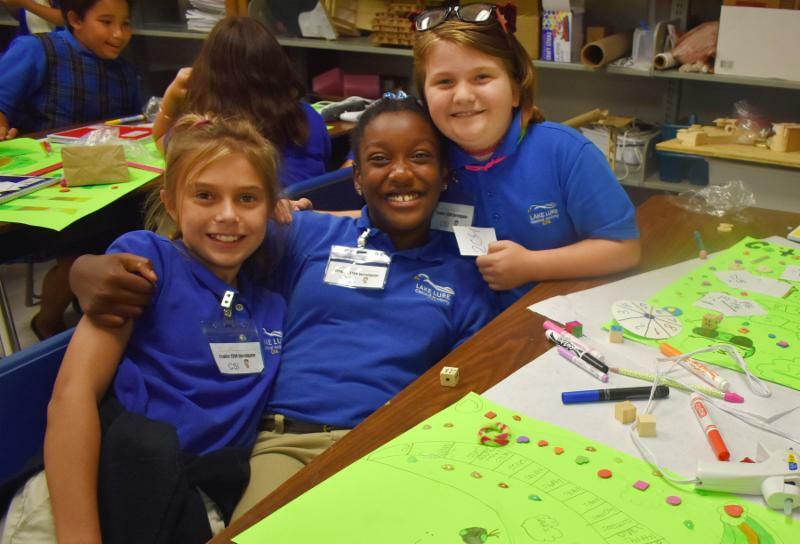 In STEM class, students designed and built their own math games. We are looking forward to the next six weeks! We have had a wonderful first six weeks! We have enjoyed getting to know all of our students and beginning our reading groups. 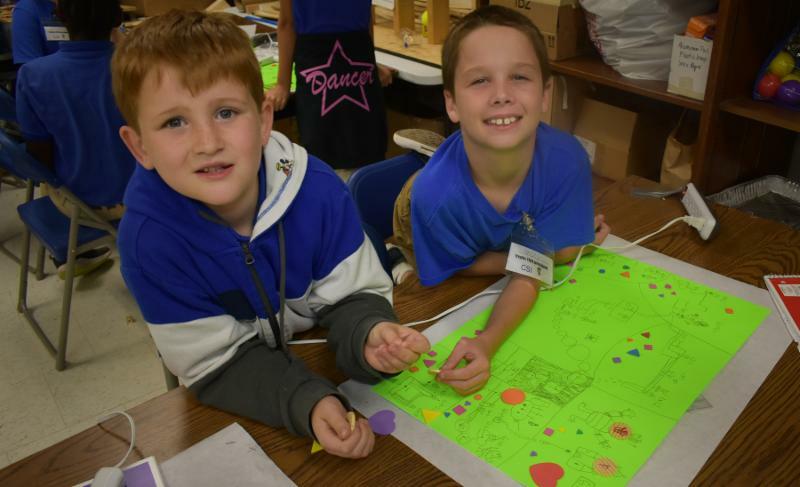 Highlights from class include STEM projects, using our computer carts, and creating NC maps with dough in art class. We have had a great first six weeks of school. I am sure the highlight for the students would be the Muddy Sneakers trip, and the best is yet to come. We had fun with our group teaching lessons (pictures on class dojo) making our Tenochtitlan Map projects and, of course, the spelling bee. We are looking forward to our next projects and activities! 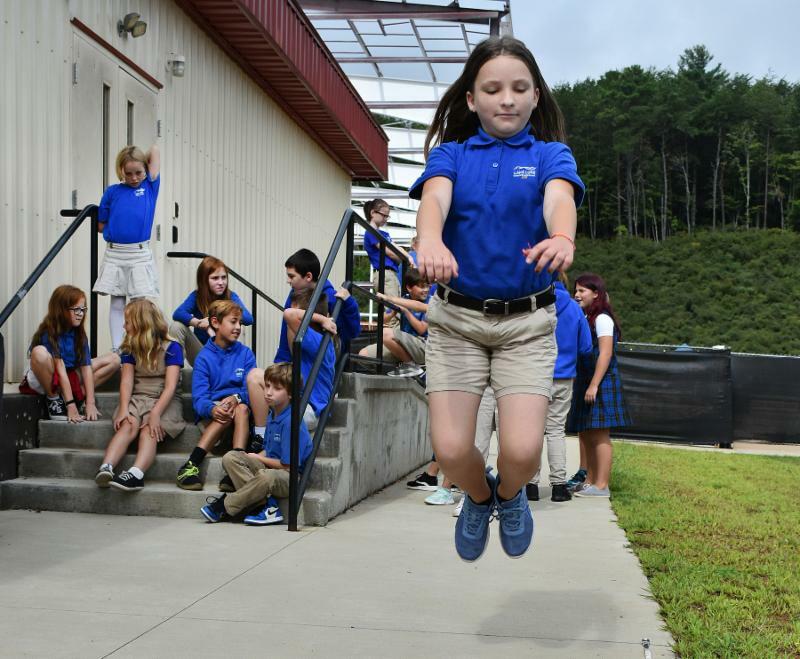 In the past six weeks, 5th graders have really accomplished a lot in math and science. In science, we learned about classifying living things, adaptations, and ecosystems. We set out on our first Muddy Sneakers expedition and learned things like how to "leave no trace" and use a compass to navigate in the woods. The students were in awe of the biodiversity of our area and asked many questions about the plants and animals they observed. We have read and discussed current events articles about space tourism, and the kinds of new species that are being discovered. "Science is fun. Science in curiosity. We all have natural curiosity. Science is a process of investigating. It's posing questions and coming up with a method. It's delving in." In Math, we have learned so much about place value and decimals. Students have worked hard through the first module of Eureka math! We have had many opportunities to work together to solve problems. We also used the computer program, Zearn, to supplement the lessons we are learning in Eureka math. "Do not worry about your problems in mathematics. I assure you mine are still greater." 6th grade is off to a busy start! 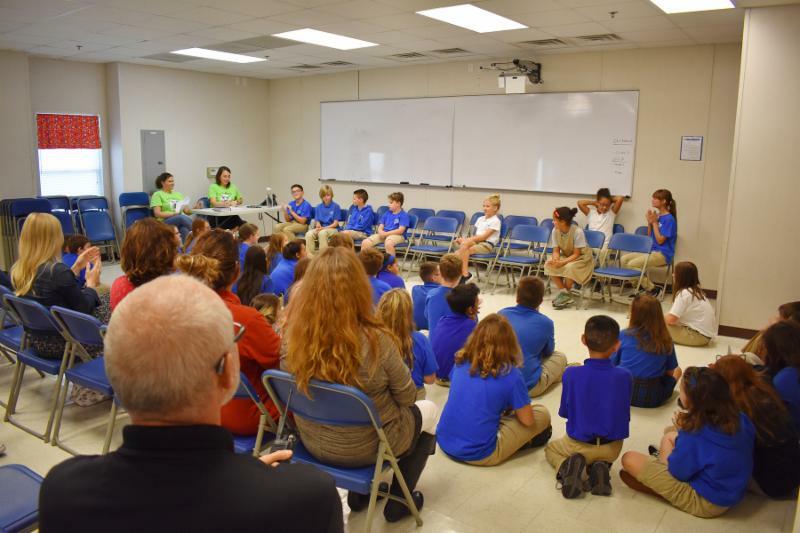 The students have come to school eager to learn and experience life as a 6th grade student. 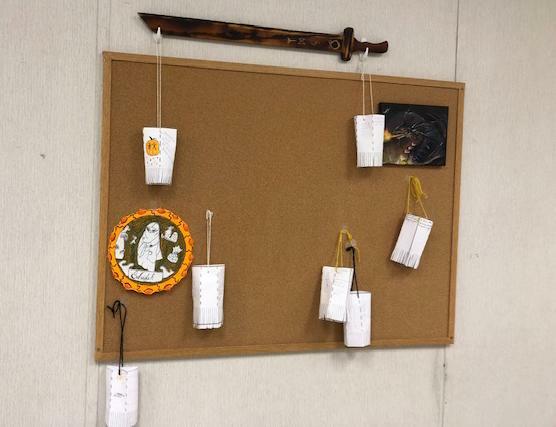 In ELA, we have wrapped up our Percy Jackson and the Lightning Thief unit. We learned how to present information in word models to our peers. The word models provided us with new ways to learn the meanings of unfamiliar words by studying antonyms, synonyms, and visual representations of new words. The students turned out to be very good teachers!! 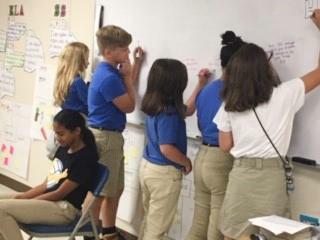 The vocabulary in our mythology and Ancient Greece and Rome unit sometimes proved to be challenging; however, our 6th graders are learning to be fearless and have the mindset that it is OK to make mistakes sometimes if we can learn something from them. We worked on new vocabulary in various ways, including word sorting and carousel rotations. Finally, in 6th grade we are trying to start a revolution of kindness and respect for each other. We have begun a “Compliment Project” where students allow their peers to write compliments to them as they sit in a chair in the front of the room. It has been a time of great thinking and learning new things about each other. It has also given the students a way to express their gratitude for the friendships they have made this year. We will be adding new ideas and projects to our compliment project throughout the school year. 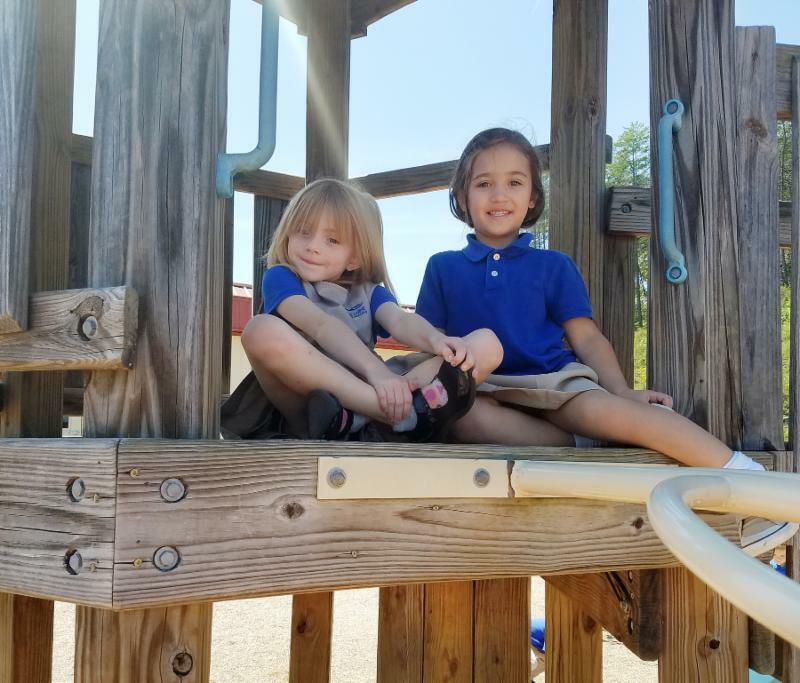 Thank you for your continued support, and please let us know if there is anything we can do for you or your child as this school year progresses! 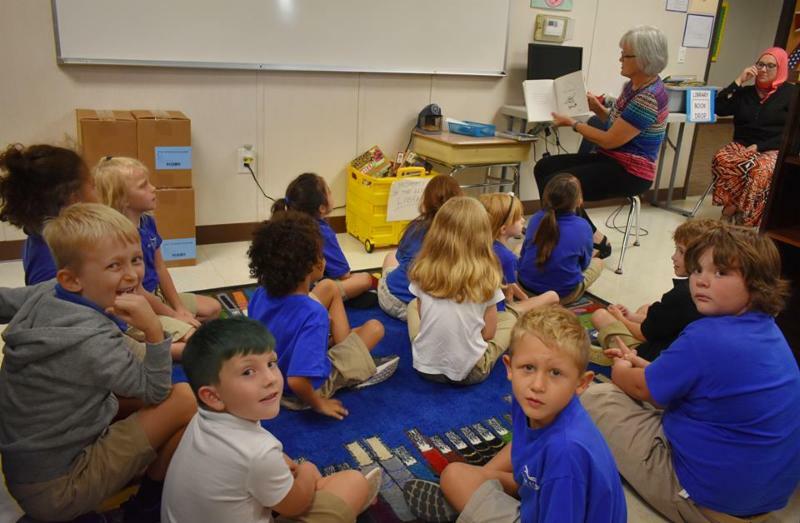 The past six weeks, K-6 students have met and discussed the role of the counselor and discussed the character word of "RESPECT." Varying grades discussed respecting ourselves, others, health, personal space, and property of others. Students have been excellent problem solvers! What a wonderful first six weeks in the LLCA library. 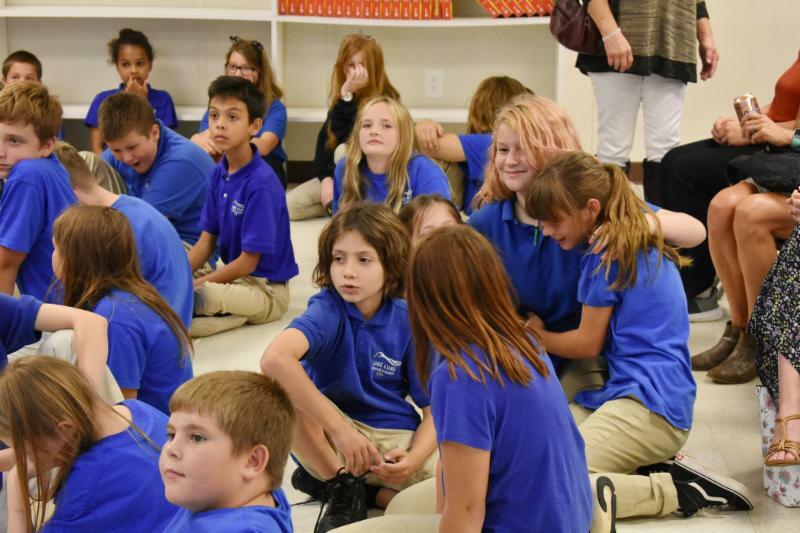 Our elementary students have checked out 1,175 books since school started. We are reading! Thank you to all the students, parents, and faculty who helped make our fall book fair such a success!